本发明涉及包含嵌入相和基质相的复合非织造纤维网，嵌入相具有形成基本上连续的三维网的一组颗粒，基质相包含围绕颗粒形成三维网的一组纤维。 The present invention relates to a composite comprising a nonwoven fibrous web embedded phase and the matrix phase, embedded in a substantially continuous phase is formed having a set of three-dimensional network of particles, the matrix phase comprising a group of fibers is formed around a three-dimensional network of particles. 本发明也涉及制备复合非织造纤维网的方法，该方法包括：形成嵌入相，嵌入相具有基本上连续的三维网中的一组颗粒；和形成基质相，基质相包含围绕颗粒形成三维网的一组纤维。 The present invention also relates to a method of making a composite nonwoven fibrous web, the method comprising: forming an embedded phase, fitted with a set of particles having a substantially continuous three-dimensional network; and a matrix phase is formed, the matrix phase comprising a three-dimensional network is formed around the particles a group of fibers. 本发明也公开了由根据上述方法制备的复合非织造纤维网制成的制品。 The present invention also discloses an article of composite nonwoven fibrous web prepared according to the method described above is made. 在示例性实施例中，该制品可以包括气体过滤制品、液体过滤制品、吸声制品、表面清洁制品、细胞生长支承制品、药物递送制品、个人卫生制品和伤口敷料制品。 In an exemplary embodiment, the article may include a gas filtration article, a liquid filtration article, a sound absorption article, a surface cleaning article, a cellular growth support article, a drug delivery article, a personal hygiene article, and a wound dressing article. 本申请要求于2007年12月31日提交的美国临时专利申请No. 61/017，842的优先权，该专利的公开内容全文以引用方式并入本文。  This application claims priority to US provisional patent on December 31, 2007 filed Application No. 61 / 017,842, the disclosure of which is incorporated by reference herein. 本发明涉及具有至少一种连续颗粒相的非织造纤维网以及制备和使用这种网的方法。  The present invention relates to a nonwoven fibrous web, and methods of making and using such a continuous web of at least one particulate phase. 本发明还涉及可用在吸收制品中的复合非织造纤维网，该复合非织造纤维网包含亚微米纤维和/或微纤维。 The present invention further relates to composite nonwoven fibrous web can be used in the absorbent article, the composite nonwoven fibrous web comprises sub-micrometer fibers and / or microfibers. 非织造纤维网已用于制备吸收制品，这些吸收制品可用作例如用于表面清洁的吸收擦拭物、用于过滤介质的气体和/或液体吸收剂和用于吸声和/或吸热的屏蔽材料。  The nonwoven webs have been used to prepare absorbent articles, such absorbent articles useful, for example for cleaning the surface of the absorbent wipes, filter media for gas and / or liquid absorbent for absorbing and / or absorbing heat shielding material. 在要求吸收性高的一些应用中，可能有利的是使用由表面积大的细小纤维形成的孔隙度高的非织造料片。 In some applications of high absorbency requirements, it may be advantageous to use a nonwoven web formed by a high porosity high surface area fines. 对于某些气体或液体过滤应用，也可能有利的是将细小吸附剂颗粒掺入由细小非织造纤维形成的料片中。 For certain gas or liquid filtration applications, it may be advantageous for the fine sorbent particles in the tablet is formed by the incorporation of fine nonwoven. 然而，细小纤维在处理时具有伸缩或压碎的趋势，从而减小可用于吸收的孔隙度和/或表面积，同时增加液体穿过非织造制品的压降。 However, the fine fibers have a tendency to flex or crush in handling, thereby decreasing the porosity and / or surface area available for absorption, while increasing the fluid pressure drop across the nonwoven article. 特别是对于气体和液体过滤应用，可能有利的是甚至在保持高吸收性的同时保持穿过非织造制品的低压降。 Particularly for gas and liquid filtration applications, it may be advantageous even while maintaining high absorbency holding a low pressure drop through the nonwoven article. 仍然存在提供紧凑型液体过滤系统（例如家用滤水系统）的需求。  still exists to provide a compact liquid filtration system (e.g. home water treatment systems) requirements. 也希望使在形成液体过滤制品的处理期间可用作过滤介质的非织造纤维网的劣化或对其造成的损坏最小化。 Also desirable to deterioration of the nonwoven web during the process of forming a liquid filtration article may be used as a filter medium or causing damage thereto is minimized. 也需要提供这样的液体过滤制品，这种制品具有主动吸收和/或吸附颗粒的高负载，而不增加整个水过滤系统上的压降。 Also a need to provide a liquid filtration article, which absorbent article has active and / or highly loaded adsorbent particles, without increasing the overall pressure drop across the water filtration system. 也有利的是，提供这样的颗粒加载的非织造纤维网，这种非织造纤维网有效地将颗粒保持在纤维基质内，从而预防颗粒释放到渗透液体中。 It is also advantageous to provide such a nonwoven web loaded particles, which nonwoven web is effective to keep the particles within the fiber matrix, thereby preventing release of particles into the liquid permeate. 另外，一直需要提供使用寿命和过滤有效性得到改进的液体过滤制品。 In addition, a continuing need to provide improved service life and filtration effectiveness of liquid filtration products. 在一个方面，本发明涉及包含嵌入相和基质相的复合非织造纤维网，所述嵌入相还包含形成基本上连续的三维网的一组颗粒，所述基质相包含围绕颗粒形成三维网的一组纤维。  In one aspect, the present invention relates to a composite comprising a nonwoven fibrous web embedded phase and the matrix phase, the embedded phase further comprises a set of forming a substantially continuous three-dimensional network of particles, comprising a matrix phase surrounding the particles form a three dimensional a group of the web. 在另一方面，本发明涉及制备包含嵌入相和基质相的复合非织造纤维网的方法，所述嵌入相具有基本上连续的三维网中的一组颗粒，所述基质相包含围绕颗粒形成三维网的一组纤维。  In another aspect, the present invention relates to a method of making a composite nonwoven fibrous web embedded phase and the matrix phase, said set of embedded phase of particles having a substantially continuous three-dimensional network in said matrix phase comprising about particles form three-dimensional network of a group of fibers. 在额外的方面，本发明涉及由根据上述方法制备的复合非织造纤维网制备的制品。  In an additional aspect, the present invention relates to articles made from a composite nonwoven fibrous web prepared according to the method described above. 在示例性实施例中，所述制品选自气体过滤制品、液体过滤制品、吸声制品、表面清洁制品、细胞生长支承制品、药物递送制品、个人卫生制品和伤口敷料制品。 In an exemplary embodiment, the article is selected from a gas filtration article, a liquid filtration article, a sound absorption article, a surface cleaning article, a cellular growth support article, a drug delivery article, a personal hygiene article, and a wound dressing article. 根据本发明的复合非织造纤维网的示例性实施例可以具有使其能够在多种应用中使用的结构特征；可以具有优越的吸收性和/或吸附性；当用作液体过滤介质时，可以显示具有高孔隙度、高流体渗透性和/或低压降；并且可以以高性价比和有效的方式进行制备。  it may have a variety of applications can be used in the structural characteristics according to an exemplary embodiment of the present invention, the composite nonwoven fibrous web; may have superior absorbency and / or adsorbent; when used as a liquid filter medium It may be displayed with a high porosity, high fluid permeability and / or low pressure drop; and may be prepared in a cost effective and efficient manner. 对本发明的示例性实施例的各个方面和优点进行了汇总。  Various aspects and advantages of the exemplary embodiments of the present invention are summarized. 上述发明内容并非意图描述本发明呈现的某些示例性实施例的每一个图示实施例或每种实施方式。 The above summary is not intended to describe each illustrated embodiment of the certain exemplary embodiments of the present invention is presented embodiment or every implementation of the embodiment. 附图和具体实施方式更具体地举例说明了使用本文所公开的原理的某些优选实施例。 The drawings and the detailed description more particularly exemplify some of the principles disclosed herein using preferred embodiments. 图4为用于形成根据本发明的另外的示例性实施例的包含基本上连续颗粒相的复合非织造纤维网的示例性设备的整体示意图。  FIG. 4 is a schematic diagram of an exemplary apparatus integrally comprising a composite nonwoven fibrous web substantially continuous particulate phase of a further exemplary embodiment of the present invention is formed. “微纤维”意指中值直径为至少一微米的纤维。  "microfibers" means a median diameter of at least one micron. “亚微米纤维”意指中值直径小于一微米的纤维。  "Sub-micrometer fibers" is meant a median fiber diameter of less than one micron. 当本文中提及某一特定种类的微纤维批、组、阵列时，如“亚微米微纤维阵列”时，其意指该阵列中的微纤维的完整组，或单个的微纤维批的完整组，而不仅仅是指属于亚微米尺寸的阵列或批中的一部分。 When  When referred to herein microfibers batch of a particular kind of the group, when the array, such as "sub-micrometer fiber array," it means the complete population of microfibers in that array, or a single microfibrils batch is complete, and not only that portion of the array or batch belongs to the submicron size. “连续取向的微纤维”意指从模具放出并通过处理工位移动的基本上连续的纤维，纤维在处理工位中被永久性地拉伸且纤维内聚合物分子的至少部分被永久性地取向成与纤维的纵向轴线准直（相对于纤维使用的“取向的”意指纤维聚合物分子的至少部分沿着纤维的纵向轴线准直）。  "Continuous oriented microfibers" means issuing from a die and substantially continuous fibers, the fibers are permanently stretched in the processing station by a mobile processing station and at least partially within the fiber polymer molecule is permanently oriented with the longitudinal axis of the collimated fibers (vs. "oriented" means fibers used fiber polymer molecules along the fiber at least a portion of the longitudinal axis of the collimator). “熔喷纤维”意指通过将熔化的成纤材料穿过模具中的喷丝孔挤出进入高速气体流而制备的纤维，挤出的材料在该气体流中首先被拉细，然后硬化成一团纤维。  "meltblown fibers" means by molten fiber-forming material through orifices in a die into the extruded fiber prepared by the high velocity gas stream, the extruded material is first attenuated gas flow, then hardened into a ball fiber. “单独制备的微纤维”意指从微微纤维成形设备（如模具)制备的微纤维流，该设备被布置为微纤维流初始与较大尺寸的微纤维流在空间上分隔（如在约I英寸（25mm)或更大的距离上），但在移动行程中与之合并以及分散到其中。  "separately prepared microfibers" means slightly from fiber forming apparatus (mold) prepared microfiber stream, the apparatus is initially arranged as a stream of microfibers and larger size of the microfiber stream separated (as in space about I inch on the (25mm) or greater distance), but the stroke movement combined therewith and dispersed therein. “非织造网”意指以纤维缠结或点粘结为特征的纤维网。  "nonwoven web" means a fiber entanglement or point bonding characterized web. “自支承”意指纤维网具有足够的抱合力和强度，以便在基本上不会被撕裂或破裂的情况下适于悬挂和可处理。  "self-supporting" means a web having sufficient coherency and strength to the suspension and may be adapted to process without substantial tearing or rupture. 根据IOcmX IOcm网样品的重量计算“网基重”。  Calculation "web basis weight" The weight IOcmX IOcm web sample. 在施加压力为150Pa的条件下，使用具有尺寸为5cmX 12. 5cm的测试仪管脚的厚度测试计在IOcmX IOcm的网样品上测量“网厚度”。  under conditions of applied pressure of 150Pa, having a size of tester pins 5cmX 12. 5cm thickness tester on the web sample measured IOcmX IOcm "thickness of the web." “堆密度”是取自文献的构成网的聚合物或共混聚合物的堆密度。  "Bulk density" is taken from the bulk density of the polymer or polymer blend constituting the web document. “分子相同聚合物”意指具有基本相同的重复分子单元的聚合物，但其在分子量、制备方法、商业形式等等方面可以不相同。  "same polymer molecule" is meant a polymer having essentially the same repeating molecular unit, but which may differ in molecular weight, method, etc., business forms. “熔喷”和“熔喷工艺”意指通过下列方式形成非织造网的方法：将纤维形成材料穿过多个喷丝孔挤出以形成原丝，同时使原丝和空气或其他细化用流体接触以将原丝细化成纤维，随后收集细化纤维层。  "meltblown" and "meltblown process" is meant a nonwoven web formed by the following manner: The fiber-forming material is extruded through a spinneret orifice to form a plurality of filaments, while the filaments and air or other thinning fluid to attenuate the filaments into contact with the fiber, refined fiber layer subsequently collected. “将原丝细化为纤维”意指将一段原丝转变成长度更长且直径更小的一段。  "attenuate the filaments into fibers" means a period of transition to a length of filaments longer and smaller diameter section. “纺粘法”和“纺粘加工”意指通过下列方式形成非织造纤维网的方法：将粘度低的熔体穿过多个喷丝孔挤出以形成原丝，用空气或其他流体将原丝骤冷，以硬化至少原丝的表面，将至少部分硬化的原丝与空气或其他流体接触，以将原丝细化成纤维，并收集以及任选地压延细化纤维层。  "spunbonding" and "spun bond process" method means a nonwoven web formed by the following manner: a low viscosity melt through a plurality of spinneret holes to form filaments extruded, with air or other fluid quenching the filaments, at least at the surface hardening of the filaments, the filaments at least partially hardened with air or other fluid contact, in order to attenuate the filaments into fibers and collecting and optionally calendering layer of the attenuated fibers. “纺粘纤维”意指利用纺粘方法制成的纤维。  "spunbond fibers" refers to fibers made using the spunbond process. 这种纤维一般是连续的且充分缠结或点粘结的，因此，通常不能从一团这种纤维中取出一根完整的纺粘纤维。 Such fibers are generally continuous and are entangled or point bonded sufficiently, thus, generally can not remove one complete spun bond fiber from a mass of such fibers. “模具”意指在聚合物熔化处理和纤维挤出处理中使用的处理组件，包括（但不限于）熔喷和纺粘处理。  "mold" means melt processing and fiber extrusion processing components used in the process, including (but not limited to) polymer meltblown and spunbond process. “粒子”和“颗粒”基本上可交换使用。  "particles" and "particulate" are used interchangeably substantially. 一般来讲，粒子或颗粒意指细碎形式的材料的不同小块或各个部分。 In general, different pieces or parts of the means in the form of finely divided particles or particulate material. 然而，颗粒也可以包括细碎形式的相关或群聚在一起的单独粒子的集合。 However, finely divided form may also include a collection of individual particles associated or clustered together particles. 因此，本发明的某些示例性实施例中所使用的单独粒子可以聚集、物理地互相结合、静电地相关或者说是相关以形成颗粒。 Thus, certain exemplary embodiments of single particles used in the present invention may be aggregated, physically intermesh, electro-statically associate or that associate to form particulates. 在某些实例中，可有意形成单独粒子团形式的颗粒，例如在美国专利No. 5，332，426 (Tang等人）中所述的那些。 In certain instances, the group may be intentionally formed in the form of particles of single particles, such as those described in U.S. Pat. No. 5,332,426 (Tang et al.) Those. “粒子加载的熔喷介质”或“复合非织造纤维网”意指具有开放式结构的缠结的纤维整体的非织造网，例如亚微米纤维，任选地为微纤维，该非织造纤维网包含在纤维当中被结合的粒子，该粒子任选地为吸收剂和/或吸附剂。 The entire fiber nonwoven web  "particle-loaded meltblown media" or "composite nonwoven fibrous web" means an open-structured entangled, for example, sub-micrometer fibers, optionally microfibers, the non nonwoven web comprises fibers which are incorporated in the particles, which particles optionally be absorbent and / or adsorbent. “被结合”意指粒子分布且物理地保持在网的纤维中。  "incorporated" means that the particle distribution and physically held in the web. 一般来讲，沿着纤维和粒子存在点接触和线接触，从而粒子的几乎整个表面积可与流体交互。 Generally, there is point contact and line contact along the fibers and particles, so that substantially the entire surface area of ​​the particles can interact with the fluid. “自生粘结”意指在烘箱或通风粘结器中，在未施加例如点粘结或压延的固体接触压力的条件下而获得的高温下的纤维间的粘结。  The bonding between fibers at an elevated temperature "autogenous bonding" means bonding ventilated oven or vessel, at point-bonding or calendering of solid contact pressure is not applied, for example, obtained. “压延”意指使产品（例如聚合物吸收剂加载的网)穿过辊以获得压缩材料的工艺。  "calendering" means that the product (e.g., a polymer absorbent loaded web) to pass through the process to obtain a roll of compressed material. 可任选地是，可以对辊进行加热。 Optionally, the rolls may be heated. “致密化”意指下述处理，通过该处理，在沉积之前或之后，对直接或间接沉积到过滤器卷绕心轴或轴柄上的纤维进行压缩，并通过设计或作为处理形成过滤器或形成的过滤器的一些方法的人为结果使得这些纤维整体或局部形成孔隙度低的区域。  "densified" means a process before or after deposition, deposited directly or indirectly to the filter winding arbor or fibers on the mandrel by the compression process, and by design or as a processing Some methods artifact of the filter or filters are formed such that the fibers formed totally or partially formed of a low porosity region. 致密化也包括压延网的处理。 Densifying calendering process also includes network. “流体处理单元”或“流体过滤系统”意指包含过滤介质的系统和将原始流体（例如未处理过的水）与处理过的流体分离的方法。  "fluid treatment unit" or "fluid filtration system" means a system comprising a filter medium and the original fluid (e.g. water untreated) method of separating the treated fluid. 这通常包括用于过滤元件和出口的过滤器壳体，以使处理过的流体以合适的方式离开过滤器壳体。 This typically includes a filter element and the outlet of the filter housing, so that the treated fluid in a suitable manner away from the filter housing. “空隙体积”意指多孔主体（例如过滤器）内未填充空间的百分比或分数值，该百分比或分数值通过测量过滤器的重量和体积、然后将过滤器重量与该相同体积的相同组分材料的实体的理论重量进行比较来计算。  "void volume" means a percentage or fractional value of the porous body unfilled space within (e.g., filter), the percentage or fraction value obtained by measuring the weight and volume of the filter, and the filter weight with the same volume theoretical weight of the same component material entity comparing calculated. “孔隙度”意指材料中的空隙空间的测量。  Measurement "porosity" means the void space in the material. 孔和空隙的尺寸、频率、数量和/或互连性影响材料的孔隙度。 Size of the holes and voids, the frequency, number, and / or affect the porosity of the material interconnectivity. “层”意指两个主表面之间形成的单层。 "Layer"  means a single stratum formed between two major surfaces. 层可以在单个网内以内部方式存在，如具有限定网厚度的第一主表面和第二主表面的单个网中形成有多层的单层。 Layer may exist internally within a single web, such as a single layer having a single web thickness of the web defining a first major surface and a second main surface formed with a plurality of layers. 层也可以存在于包含多个纤维网的复合制品中，如当具有限定网厚度的第一主表面和第二主表面的第一网被具有限定第二网厚度的第一主表面和第二主表面的第二网覆盖或垫起时（在这种情况下，第一网和第二网中的每一个均形成至少一层）第一网中的单层。 Layer may also exist in a composite article comprising a plurality of webs, such as when the first web first major surface and second major surface having a web thickness is defined having a first major surface defining a second thickness and a second web when the second web is overlaid or underlaid main surface (in this case, the first and second webs are formed in each of the at least one) of the single network. 另外，层可以同时存在于单个网内、该网和一个或多个其它网之间，每一个网形成一层。 In addition, layers may simultaneously exist within a single web and between that web and one or more other networks, each web forming a layer. 参照特定的第一层的“邻接”意指在下述位置与另一个第二层接合或附接，在所述位置，第一层和第二层彼此紧邻（即相邻）并且彼此直接接触，或彼此邻接但不直接接触(即在第一层和第二层之间居间存在一个或多个额外的层）。  with reference to specific "adjacent" is meant in the following the first layer the second layer is bonded to another position or attached in said position, the first and second layers adjacent to each other (i.e., adjacent) to each other and in direct contact with, or adjacent to, but not in direct contact (i.e. there are one or more additional layers intervening between the first and second layers) with each other. “颗粒密度梯度”、“吸附剂密度梯度”和“纤维组密度梯度”意指特定纤维组内的颗粒、吸附剂或纤维材料的量（如网的整个限定面积上每单位体积的给定材料的数量、重量或体积）在整个复合非织造纤维网上不必均一，并且它可有差别，从而在某些区域中获得较多的材料，并且在其它区域中获得较少的材料。  "particle density gradient", "sorbent density gradient," and "fiber density gradient group" means a group of particles in a particular fiber, the amount of sorbent or fibrous material (e.g., the entire defined area per unit volume of the web to the number, weight or volume of a given material) throughout the composite nonwoven fibrous web not necessarily uniform, and it may be a difference, thereby obtaining more material in certain areas, and less material is obtained in the other regions. 现在将具体参照附图对本发明的多种示例性实施例进行描述。  Now with particular reference to the accompanying drawings various exemplary embodiments of the present invention will be described. 本发明的某些示例性实施例中的示例性实施例可以在不脱离本发明的精神和范围的情况下具有多种修改和更改。 Exemplary embodiments certain exemplary embodiments of the present invention may have various modifications and alterations without departing from the spirit and scope of the invention. 因此，应当理解，本发明的实施例不应限于以下所述的示例性实施例，但应受权利要求及其任何等同物中示出的限制的控制。 Thus, it should be understood that the embodiments of the present invention should not be limited to the exemplary embodiments described below, but the control of the claims and any equivalents thereof shall be shown by the restriction. 在一个方面，本发明提供包含嵌入相和基质相的复合非织造纤维网，所述嵌入相还包含形成基本上连续的三维网的一组颗粒，所述基质相包含围绕颗粒形成三维网的一组纤维。  In one aspect, the present invention provides a composite comprising a nonwoven fibrous web embedded phase and the matrix phase, said set of embedded particles of a substantially continuous three-dimensional network phase further comprises forming a matrix phase surrounding the particles comprising a three-dimensional a group of the web. 在本发明的一个示例性实施例中，将颗粒掺入包含微纤维和/或亚微米纤维的非织造纤维网中，使得颗粒形成基本上连续的第一相，第一相分布于包含微纤维和/或亚微米纤维的基本上连续的第二相中。  In one exemplary embodiment of the present invention, comprising the particles into microfibers and / or nonwoven webs of sub-micrometer fibers, such that the particles form a substantially continuous first phase, a first phase distributed in They comprise microfibers and / or sub-micrometer fibers substantially continuous second phase. 因此，第一相和第二相均基本上共同连续。 Therefore, the first and second phases are substantially co-continuous. 在本发明的另一个示例性实施例中，将亚微米纤维掺入包含微纤维的非织造纤维网中，使得亚微米纤维形成基本上连续的第一相，第一相分布于包含微纤维的基本上连续的第二相中。  In another exemplary embodiment of the present invention, the sub-micrometer fibers into a nonwoven web comprising microfibers, so that the sub-micrometer fibers form a substantially continuous first phase distributed in a first phase comprising a second phase of a substantially continuous microfibers. 因此，第一相和第二相均基本上共同连续。 Therefore, the first and second phases are substantially co-continuous. 在本发明的额外的示例性实施例中，将颗粒和不连续（例如短）微纤维掺入包含微纤维和/或亚微米纤维的非织造纤维网中，使得颗粒和短微纤维形成基本上连续的第一相，第一相分布于包含微纤维和/或亚微米纤维的基本上连续的第二相中。  In an additional exemplary embodiment of the present invention, the particles and a discontinuous (e.g., short) incorporating microfibers comprise microfibers and / or nonwoven webs of sub-micrometer fibers, such that the particles and short microfibers form a substantially continuous first phase distributed in a first phase comprising the microfibers and / or a substantially continuous phase of a second sub-micrometer fibers. 因此，第一相和第二相均基本上共同连续。 Therefore, the first and second phases are substantially co-continuous. 参见图1A，该图示出了示出根据本发明的复合非织造纤维网的一个示例性实施例的示意图。  Referring to Figure 1A, which illustrates a schematic view showing a composite nonwoven fibrous web according to the present invention exemplary embodiments. 单层复合非织造纤维网10由嵌入相和基质相形成，嵌入相包含细小粒子形式的一组颗粒14，该组颗粒14形成基本上连续的三维网，基质相包含形成围绕颗粒14的三维网的一组纤维12。 Single-layer composite nonwoven fibrous web 10 is formed by an embedded phase and the matrix phase, a set of particles embedded phase comprising a fine particle form 14, the set of particles 14 form a substantially continuous three-dimensional network matrix phase comprising a three-dimensional network is formed around the particles 14 12 is a set of fibers. 在图IA的图示实施例中，颗粒14显示为形成嵌入相的不同的单独粒子，在这些粒子中，每一个单独粒子与至少一个其它粒子以面到面的方式接触，所述嵌入相由单独粒子(如粒子链）的基本上连续的三维网形成。  In the illustrated embodiment of FIG IA, the particles 14 is shown as formed separately embedding a different phase particles, these particles, the individual particles are in contact with each of the at least one other manner to the surface of the particles to the surface of the fitted with a single particles (e.g. particle chains) are substantially continuous three-dimensional network is formed. 虽然图IA中的单独粒子显示为几何形状不均一的固态粒子，但应当理解，该组颗粒可以包括任何形状和/或构造的粒子。  While Figure IA single particles in display unevenness is a solid particle geometry, they should be understood that the group of particles may comprise any particle shape and / or configuration. 例如，粒子中的一些或所有粒子可以具有均一的规则几何形状（如球形、椭圆形、多边形、类似针形等等）或甚至不规则的形状。 For example, some or all of the particles in the particles may have a uniform regular geometric shape (e.g., spherical, elliptical, polygonal, needle-like, etc.) or even an irregular shape. 另外，可以使用中空粒子或多孔粒子。 In addition, hollow particles or porous particles. 在图IB中示出的另一个示例性实施例中，单层复合非织造纤维网20由嵌入相和基质相形成，所述嵌入相包含不连续纤维形式的一组颗粒24，该组颗粒24形成基本上连续的三维网，所述基质相包含一组纤维22，该组纤维22形成围绕颗粒24的三维网。  Another exemplary embodiment illustrated exemplary embodiment, the single-layer composite nonwoven fibrous web 20 in FIG. IB phase formed by phase embedded in the matrix and, embedded in the particulate phase comprises a set of discontinuous fibers in the form of 24, the group particles 24 form a substantially continuous three-dimensional network, the matrix phase comprises a set of fibers 22, the group of fibers 22 is formed around a three-dimensional network of particles 24. 在图IB的图示实施例中，颗粒24显示为形成嵌入相的各个不连续纤维，在这些纤维中，每一个单独不连续纤维与至少一个其它不连续纤维以面到面的方式接触，所述嵌入相由单独粒子（如单独不连续纤维链）的基本不连续三维网形成。 In the illustrated embodiment of FIG IB, the particles 24 shows the various fibers to form discontinuous phases embedded in these fibers, each individual discontinuous fibers with at least one other discontinuous fiber in a face to face contact manner, the embedding said particles from a separate phase (e.g., a single chain discontinuous fibers) in substantially continuous three-dimensional network is formed. 在图IC中示出的另一个示例性实施例中，单层复合非织造纤维网30由嵌入相和基质相形成，嵌入相包含与多个不连续纤维36粘结在一起的单独粒子形式的一组颗粒34，该颗粒形成基本上连续的三维网，基质相包含一组纤维32，该组纤维32形成围绕颗粒34的三维网。  Another exemplary embodiment illustrated exemplary embodiment, the single-layer composite nonwoven fibrous web 30 is formed by an embedded phase and the matrix phase in an IC, the insert comprising a single phase with a plurality of discontinuous fibers 36 bonded together a set of particles in the form of particles 34, the particles form a substantially continuous three-dimensional network matrix phase contains a set of fibers 32, the group of fibers 32 is formed around the three-dimensional network of particles 34. 在图IC的图示实施例中，颗粒34显示为形成嵌入相的不同的单独粒子，在这些粒子中，每一个单独粒子与至少一个其它粒子以面到面的方式接触，所述嵌入相由单独粒子(如粒子链）的基本上连续的三维网形成。  In the illustrated embodiment of FIG IC, the embedded particles 34 is shown as formed of single particles of different phases, these particles, the individual particles are in contact with each of the at least one other particle in surface-to-face manner, the fitted with a single particles (e.g. particle chains) are substantially continuous three-dimensional network is formed. 然而，单独颗粒34不必如所示那样以面到面的方式接触，因为单独颗粒34的至少一部分被多个不连续纤维36保持在一起，并且每一个单独不连续纤维与至少一个其它不连续纤维或另一个颗粒以面到面的方式接触，从而形成嵌入相，嵌入相由单独粒子（如单独不连续纤维链）的基本上连续的三维网形成。 However, not necessary that the individual particles 34 in the manner to the contact surface plane, as shown, since at least a portion of the individual particles 34 are a plurality of discontinuous fibers 36 held together, and each individual discontinuous fibers with at least one other discontinuous fiber or other particles to the surface of the surface contacting manner, thereby forming the embedded phase embedded phase formed of single particles (e.g., single chain discontinuous fibers) in a substantially continuous three-dimensional network. 此外，虽然图IC中的单独粒子显示为几何形状不均一的固态粒子，但应当理解，该组颗粒可以包括任何形状和/或构造的粒子。  Further, although in FIG IC single particles display unevenness of a solid particle geometry, they should be understood that the group of particles may comprise any particle shape and / or configuration. 例如，粒子中的一些或所有粒子可以具有均一的规则几何形状（如球形、椭圆形、多边形、类似针形等等）或甚至不规则形状。 For example, some or all of the particles in the particles may have a uniform regular geometric shape (e.g., spherical, elliptical, polygonal, needle-like, etc. ), or even irregular shape. 另外，可以使用中空粒子或多孔粒子。 In addition, hollow particles or porous particles. 在图ID中示出的另一个示例性实施例中，形成多层复合非织造纤维网。  In FIG. ID another exemplary embodiment shown, is formed a multilayer composite nonwoven fibrous web. 多层复合纤维网40包含支承层50。 The multilayer composite web 40 comprising a support layer 50. 如图ID所示，支承层50可以支承图IC中示出的由嵌入相和基质相形成的单层复合非织造纤维网30，嵌入相包含与多个不连续纤维36粘结在一起的单独粒子形式的一组颗粒34，该颗粒形成基本上连续的三维网，基质相包含形成围绕颗粒34的三维网的一组纤维32。 FIG. ID, the support layer 50 may be supported in an IC layer composite nonwoven fibrous web by the embedded phase and the matrix phase formation 30 shown, fitted with a plurality of separate phase comprising discontinuous fibers bonded together with 36 in the form of particles of a set of particles 34, the particles form a substantially continuous three-dimensional network matrix phase comprising a group of fibers 32 is formed around the three-dimensional network of particles 34. 或者，任选支承层可以用于支承图IA的单层复合非织造纤维网10 (未示出），或图IB的单层复合非织造纤维网20 (未示出）。 Single-layer composite nonwoven fibrous web 10 (not shown), or IB of FIG layer composite nonwoven fibrous web or, optionally may be used for supporting the support layer 20 of FIG. IA (not shown). 虽然图ID中示出双层构造，但应当理解，其它多层复合非织造纤维网也在本发明的范围内。  Although FIG ID shows a double structure, it should be understood that, within the scope of other multi-layer composite nonwoven fibrous web according to the present invention also. 因此，例如包含3、4、5或任何数量层、具有任何结构和/或组成、按任何顺序排列的多层复合非织造纤维网构造都在本发明的范围内，前提条件是至少一层包含嵌入相和基质相，嵌入相还包含一组颗粒，该颗粒形成基本上连续的三维网，基质相包含一组纤维，该纤维形成围绕颗粒的三维网。 Thus, for example comprising five or any number of layers, having any structure and / or composition, multi-layer composite nonwoven fibrous web structure are arranged in any order within the scope of the present invention, with the proviso that at least one layer comprising embedded phase and the matrix phase, embedded phase further contains a set of particles, which particles form a substantially continuous three-dimensional network matrix phase contains a set of fibers which is formed around the three-dimensional network of particles. 已经发现的是，可以通过以下方式形成包含一组纤维的基质相：将亚微米纤维流与微纤维流结合，在一些示例性实施例中，微纤维流可以是中值直径为一微米或二微米或更小的非常细小的纤维流，然后，亚微米纤维被微纤维流捕集，并分散在微纤维当中。  It has been found that the matrix phase contains a set of fibers may be formed by the following ways: combining the sub-micrometer fiber stream with the microfiber stream, in some exemplary embodiments, the micro fiber stream may be a median diameter two microns or micrometers or less very fine fiber flow, then, sub-micrometer fiber stream is trapped microfibers, the microfibers and dispersing them. 当与美国临时专利申请No. 61/071，230的公开内容结合时，这种实施例在本发明的范围内。 When the disclosure U.S. Provisional Patent Application No. 61 / 071,230 in conjunction with such embodiments within the scope of the present invention. 因此，在以上结合的公开内容的范围内的某些示例性实施例（未示出）中，构成基质相的该组纤维的至少一部分可以包含亚微米纤维。  Thus, certain exemplary embodiment (not shown) within the scope of the disclosure of the above in combination, at least a part of the group of fibers constituting the matrix phase may comprise sub-micrometer fibers. 在其它示例性实施例中，构成基质相的该组纤维的至少一部分包含一组亚微米纤维，基质相还包含一组微纤维。 In other exemplary embodiments, constituting at least a portion of the set contains a set of sub-micrometer fibers of the fibrous matrix phase, the matrix phase further contains a set of micro fibers. 在额外的示例性实施例（未示出）中，该组亚微米纤维形成有该组微纤维。 In an additional exemplary embodiment (not shown), the set of sub-micrometer fibers is formed with the micro fibers. 在其它示例性实施例（未示出）中，该组亚微米纤维的至少一部分与该组微纤维分开形成。 (Not shown) formed in the other exemplary embodiment of the set of at least a portion of the microfibers separate sub-micrometer fibers. 在一些示例性实施例（未示出）中，该组微纤维在组成上与该组亚微米纤维相同。 In some exemplary embodiments (not shown), the set with the same microfibers sub-micrometer fibers in the composition. 在以上结合的公开内容的范围内的额外的示例性实施例（未示出）中，复合非织造纤维网具有厚度，亚微米纤维数与微纤维数的比率在复合非织造纤维网的整个厚度上有差别。  Additional exemplary embodiment (not shown) within the scope of the disclosure above in combination, the composite nonwoven fibrous web has a thickness, the ratio of sub-number-micrometer fibers to the number of microfibers in a composite nonwoven fibrous web the entire thickness difference. 在一些示例性实施例（未示出）中，亚微米纤维数与微纤维数的比率在复合非织造纤维网的整个厚度上递减。 , The ratio of the number of sub-micrometer fibers to the number of microfibers decreases in the entire thickness of the composite nonwoven fibrous web in some exemplary embodiments (not shown). 在其它示例性实施例（未示出）中，亚微米纤维数与微纤维数的比率从靠近由复合非织造纤维网的一半厚度限定的中心线的峰值变化到在复合非织造纤维网的表面处的较低值。 In other exemplary embodiments (not shown), the ratio of the number of sub-micrometer fibers to the number of microfibers varies from a peak defined by a thickness close to half of the composite nonwoven fibrous web to the center line of the surface of the composite nonwoven fibrous web at a lower value. 另外，通过使用上述结合的公开内容的某些示例性实施例，可以粘结收集的微纤维，优选通过自生热粘结步骤来粘结收集的微纤维，以形成自支承的连贯基质，在连贯基质中，微纤维被牢靠地支承和保护，所以，可以以微纤维的最小损失或压碎来处理和使用网。  Further, by using the above embodiments certain exemplary embodiments of the disclosure in combination, can be collected microfibers bonded, preferably thermally bonded by autogenous bonding step to collect the microfibers to form a coherent self-supporting matrix in coherent matrix, the microfibers being firmly supported and protected, it is possible to minimize the loss of microfibers or crushed to handle and use networks. 优选地，微纤维为由半结晶性聚合物材料构成的取向的纤维，从而增加了该网的机械特性或物理特性。 Preferably, microfibers by the orientation of the semicrystalline polymer material fibers, thus increasing the mechanical or physical property of the net. 此外，在以上结合的公开内容的范围内的额外的示例性实施例中，可以将颗粒的至少一部分粘结到该组纤维的至少一部分。  Furthermore, additional exemplary embodiments within the scope of the disclosure of the above in combination, at least a portion of the particles adhered to at least a portion of the group of fibers. 在某些额外的实施例中，可以将颗粒的至少一部分粘结到分开形成的该组纤维的至少一部分。 At least a portion of the additional group of fibers in certain embodiments, the particles may be bonded to at least a portion of the separately formed. 在某些目前优选的实施例中，可以将颗粒的至少一部分粘结到该组微纤维的至少一部分。 In certain presently preferred embodiments, at least a portion of the particles may be bonded to at least a portion of the microfibers. 就根据本发明的复合非织造纤维网的示例性实施例中的任何者而言，网将显示具有可以根据该网的特定的最终用途而有差别的基重。  According to an exemplary embodiment of a composite nonwoven fibrous web according to the present invention, any person concerned, the web may exhibit differential depending upon the particular end use of the web basis weight. 通常，纤维网的基重为小于约1000克/平方米（gsm)。 Typically, the basis weight of the web is less than about 1000 grams / square meter (gsm). 在一些实施例中，网的基重为从约I. Ogsm到约500gsm。 In some embodiments, the basis weight of the web is from about I. Ogsm to about 500gsm. 在其它实施例中，网的基重为从约IOgsm到约300gsm。 In other embodiments, the basis weight of the web is from about IOgsm to about 300gsm. 与基重一样，复合非织造纤维网将显示具有可以根据该网的特定的最终用途而有差别的厚度。  with the basis weight, the composite nonwoven fibrous web may exhibit a difference depending on the particular end use of the web thickness. 通常，网的厚度为小于约300毫米（_)。 Typically, the thickness of the web is less than about 300 mm (_). 在一些实施例中，网的厚度为从约O. 5mm到约150mm。 In some embodiments, the thickness of the web is from about O. 5mm to about 150mm. 在其它实施例中，网的厚度为从约I. Omm到约50mm。 In other embodiments, the thickness of the web is from about I. Omm to about 50mm. 在其它示例性实施例中，复合非织造纤维网可以具有厚度，并显示具有小于10%的密实度。  In other exemplary embodiments, the composite nonwoven fibrous web may have a thickness and exhibits a Solidity of less than 10%. 特别是，本申请人相信，迄今为止，还不知道，为了控制所得复合非织造纤维网的孔隙度和渗透性，通过控制复合非织造纤维网内的亚微米纤维数与微纤维数的比率来将密实度控制到小于10%。 In particular, the present applicants believe that, to date, do not know, in order to control porosity and permeability of the resulting composite nonwoven fibrous web, by controlling the ratio of the number of sub-micrometer fibers to the number of micro fibers within the composite nonwoven fibrous web to the control solidity to less than 10%. 现在将对根据本发明的示例性复合非织造纤维网的多种特性和组分进行描述。  will now be described in terms of various properties and components of exemplary composite nonwoven fibrous web according to the present invention. 如上所述，根据本发明的示例性复合非织造纤维网包括含有一组颗粒的嵌入相。  As described above, according to exemplary composite nonwoven fibrous web according to the present invention comprises a set of particles containing embedded phases. 可以选择任何合适的颗粒材料。 You may select any suitable particulate material. 合适的颗粒可以具有多种物理形式（如固态粒子、多孔粒子、中空泡、团块、不连续纤维、短纤维、薄片等等）；形状（如球形、椭圆形、多边形、针形等等）；形状均匀度（如单分散、基本上均一、不均一或不规则等等）；组成（如无机颗粒、有机颗粒或它们的组合）；和尺寸（如亚微米尺寸、微尺寸等等）。 Suitable particles may have a variety of physical forms (e.g., solid particles, porous particles, hollow bubbles, agglomerates, discontinuous fibers, staple fibers, flakes, etc. ); a shape (such as spherical, elliptical, polygonal, needle-like) ; uniformity of shape (e.g., monodisperse, substantially uniform, non-uniform or irregular, etc. ); composition (e.g., inorganic particles, organic particles, or a combination thereof); and size (e.g., sub-micron size, micro size, etc.). 在另外的示例性实施例中，颗粒包含一组中值直径至多为约2. 000 μ m、更优选地至多为约1，000 μ m、最优选地至多为约500 μ m的一组微尺寸的颗粒。  In further exemplary embodiments, the particle comprises a set of median diameter of up to about 2. 000 μ m, more preferably at most about 1,000 μ m, most preferably at most about 500 μ m of a group of micro-sized particles. 在其它示例性实施例中，颗粒包含一组中值直径最多为约10 μ m、更优选地至多为约5 μ m、甚至更优选地至多为约2 μ m的一组微尺寸的颗粒。 In other exemplary embodiments, the particle comprises a set of median diameter of up to about 10 μ m, more preferably up to about 5 μ m, and even more preferably at most a group of micro-sized particles of from about 2 μ m. 在某些示例性实施例中,颗粒可以包含具有上述中值直径的不连续纤维。 In certain exemplary embodiments, the particles may comprise discontinuous fibers having the above-described median diameter. 在单个成品网内，也可以使用多种类型的颗粒。  The finished within a single network, may be used various types of particles. 通过使用多种类型的颗粒，即使颗粒类型中的一种不与相同类型的其它粒子粘结，也可以生成连续的颗粒纤维网。 By using various types of particles, one particle type is even not bond with other particles of the same type, may generate a continuous particulate webs. 这种类型系统的实例将会是这样一种系统，在该系统中，使用两种类型粒子，一种类型的粒子将颗粒(如不连续聚合物纤维颗粒）粘结在一起，另一种类型的粒子起到用于网的所需用途的活性粒子（如吸附剂颗粒（例如活性炭））的作用。 Examples of this type of system would be one system, in the system, two types of particles, the particles of one type of particle (e.g., a discontinuous polymeric fiber particulate) bonded together, another type particles function as an active particles (e.g., particles of adsorbent (e.g. activated charcoal)) role for the desired use of the web. 这种示例性实施例对于流体过滤应用可能特别可用。 For this exemplary embodiment may be particularly useful in fluid filtration applications. 在某些这种示例性实施例中，可能有利的是，使用具有下述表面的至少一种颗粒，该表面可被制备为粘性的或“发粘的”，以便将颗粒粘结在一起，以形成用于纤维组分的网片或支承基质。  In some such exemplary embodiments, it may be advantageous to use at least one particle has a surface, the surface may be prepared as sticky or "tacky" so that the particles are bound together to form a mesh or support matrix for the fiber component. 就这一点而言，可用的颗粒可以包含聚合物，例如可以为不连续纤维形式的热塑性聚合物。 In this regard, useful particles may comprise a polymer, for example, may be a form of discontinuous fibers of a thermoplastic polymer. 合适的聚合物包括聚烯烃，特别是热塑性多烯键弹性体（TPE，如可得自Exxon-Mobil Chemical 公司（Houston,Texas)的VISTMAXX™)。 Suitable polymers include polyolefins, especially multi-ethylenically thermoplastic elastomer (TPE, such as available from Exxon-Mobil Chemical Company (Houston, Texas) is VISTMAXX ™). 在另外的不例性实施例中，由于TPE—般一定程度地发粘（这可以有助于在添加纤维以形成复合非织造纤维网之前将颗粒粘结在一起以形成三维网），所以包含TPE的颗粒（特别是作为表面层或表面涂层）可以是优选的。 In a further embodiment not embodiment, since a certain degree as TPE- tacky (which may facilitate the addition of fibers to form a composite nonwoven fibrous web before the particles bonded together to form a three dimensional network), it contains TPE particles (especially as a surface coating or surface layer) may be preferred. 在某些示例性实施例中，包含VISTMAXX™TPE的颗粒可以提供改善的抗苛刻化学环境的能力，特别是在PH低（如不大于约3的pH)和pH高（如为至少约9的pH)和在有机溶剂中的环境。 In certain exemplary embodiments, the particles comprise VISTMAXX ™ TPE may offer improved resistance capacity to harsh chemical environments, particularly at low PH (such as not greater than about pH 3) and high pH (eg at least about 9 pH) environment and in an organic solvent. 在额外的示例性实施例中，可能有利的是，使用至少一种吸附剂粒子，例如吸收齐U、吸附剂、活性炭、阴离子交换树脂、阳离子交换树脂、分子筛或它们的组合。  In an additional exemplary embodiment, it may be advantageous to use at least one sorbent particles, such as absorption Qi U, an adsorbent, activated carbon, an anion exchange resin, cation exchange resin, molecular sieves, or a combination thereof. 可采用多种吸附剂粒子。 Variety of sorbent particles can be employed. 有利地，吸附剂粒子能够吸收或吸附预计在拟定使用条件下存在的气体、气溶胶或液体。 Advantageously, the sorbent particles capable of absorbing or adsorbing the presence of expected conditions of use in the preparation of gases, aerosols or liquids. 吸附剂粒子可呈任何可使用的形式，包括小珠、薄片、颗粒剂或团块。  sorbent particles can be in any usable form including beads, flakes, granules or agglomerates. 优选的吸附剂粒子包括活性炭；氧化铝和其它金属氧化物；碳酸氢钠；可通过吸附、化学反应或汞齐化从流体移除组分的金属粒子（如银粒子）；粒状催化剂，例如霍加拉特（其可催化一氧化碳的氧化）；粘土和其他由酸性溶液（例如乙酸）或碱性溶液（例如氢氧化钠水溶液）处理过的矿物；离子交换树脂；分子筛和其他沸石；二氧化硅；杀生物剂；杀真菌剂和杀病毒剂。 Preferred sorbent particles include activated carbon; alumina and other metal oxides; sodium bicarbonate; a, chemical reaction or amalgamation remove the metal particle component (e.g., silver particles) from a fluid by adsorption; particulate catalyst, e.g. Huo Gallate (which can catalyze the oxidation of carbon monoxide); clay and other processing by the acidic solution (e.g. acetic acid) or basic solution (e.g. aqueous sodium hydroxide) through the mineral; ion exchange resin; molecular sieves and other zeolites; silica ; biocides; fungicide and virucide. 活性炭和氧化铝是特别优选的吸附剂粒子。 Activated carbon and alumina are particularly preferred sorbent particles. 尽管也可采用吸附剂粒子的混合物（如以吸收气体混合物），但在实践中，对于处理气体混合物来说，制造在各个层中采用单独的吸附剂粒子的多层薄片制品可能较好。 Although the mixture may also be employed (e.g., to absorb mixtures of gases), but in practice, for the process gas mixture, the individual sorbent particles employed for producing a multilayer sheet article may be preferably in the sorbent particles in the individual layers. 所需的吸附剂粒度可能有很大差别，且通常部分地根据拟定使用条件来选择。  The desired sorbent particle size can vary widely, and is generally selected in part on the intended service conditions. 作为一般指导，吸附剂粒子在尺寸方面可以有差别，中值直径为从约O. 001到约3000 μπι。 As a general guide, the sorbent particles may differ in size, the median diameter of from about O. 001 to about 3000 μπι. 优选地，吸附剂粒子的中值直径为从约O. 01到约1500 μ m、更优选地从约O. 02到约750 μ m、最优选地从约O. 05到约300 μ m。 Preferably, the median diameter of the sorbent particles is from about O. 01 to about 1500 μ m, more preferably from about O. 02 to about 750 μ m, most preferably from about O. 05 to about 300 μ m. 在某些示例性实施例中，吸附剂粒子可以包含一组中值直径小于I μ m的纳米粒子。 In certain exemplary embodiments, the sorbent particles may contain a group median diameter of less than I μ m nanoparticles. 多孔纳米粒子可以具有提供用于从流体介质吸附污染物（如吸收和/或吸附）的大表面积的优点。 The porous nanoparticles may have the advantage of providing for adsorbing contaminants from a fluid medium (e.g., absorption and / or adsorption) of large surface area. 也可采用由尺寸范围不同的吸附剂粒子的混合物（如双峰的混合物），但在实际中，制备在上游层采用较大的吸附剂粒子而在下游层采用较小的吸附剂粒子的多层薄片制品可能较好。  may also be a mixture of different size ranges (e.g., bimodal mixtures) of sorbent particles, but in practice, the upstream layer was prepared using a larger and a smaller sorbent particles in a downstream layer of the adsorbent the particles may be preferred multilayer sheet article. 将至少80重量％的吸附剂粒子、更优选为至少84重量％以及最优选为至少90重量％的吸附剂粒子在纤维网中结合。 At least 80 weight percent sorbent particles, more preferably at least 84 wt% and most preferably 90 weight percent sorbent particles are incorporated at least in the web. 以网基重表达，对于相对细小（如亚微米尺寸）的吸附剂粒子，吸附剂粒子装填量可以为例如至少约500gsm，对于相对粗糙（如微尺寸）的吸附剂粒子，吸附剂粒子装填量可以为例如至少约2，OOOgsm。 Expression in the web basis weight, for relatively fine (e.g. sub-micrometer-sized) sorbent particles, sorbent particle loading level may for example be at least about 500 gsm for relatively coarse (e.g., micro-sized) sorbent particles, sorbent particle loading level It may be, for example, at least about 2, OOOgsm. 如上所述，根据本发明的示例性复合非织造网包含基质相，基质相包含围绕颗粒形成三维网的一组纤维。  As described above, according to exemplary composite nonwoven web of the present invention comprises a matrix phase, the matrix phase comprising a population of fibers is formed around a three-dimensional network of particles. 合适的纤维组可以包含亚微米纤维、微纤维、超细微纤维或它们的组合。 Suitable fiber component may comprise sub-micrometer fibers, microfibers, ultrafine fibers, or combinations thereof. 在某些示例性实施例中，该组纤维可以为取向的。  In certain exemplary embodiments, the set of fibers may be oriented. 取向的纤维为在纤维内存在分子取向的纤维。 Oriented fibers are fibers where the fiber orientation of the molecules. 完全取向和部分取向的聚合物纤维是已知的，并且可商购获得。 Oriented completely and partially oriented polymeric fibers are known and commercially available. 可以以许多方式测量纤维取向，包括双折射率、热收缩量、X射线散射和弹性模量（参见如Principlesof PolymerProcessinR (聚合物处理原理),Zehev Tadmor and Costas Gogos, Johnffileyand Sons, New York,1979,pp.77-84)。 Can be measured in many ways fiber orientation, including birefringence, thermal shrinkage, X-ray scattering, and elastic modulus (see, e.g. Principlesof PolymerProcessinR (Polymer Processing principle), Zehev Tadmor and Costas Gogos, Johnffileyand Sons, New York, 1979, pp.77-84). 重要的是应当指出，由于结晶材料和非结晶材料两者均可显示具有与结晶无关的分子取向，所以分子取向与结晶度不同。  important to note that, since both the crystalline material and the amorphous material can exhibit molecular orientation independent of the crystal, the different molecular orientation and crystallinity. 因此，即使市售的已知的通过熔喷或静电纺纱制备的亚微米纤维不是取向的，但存在将分子取向赋予使用这些方法制备的纤维的已知方法。 Thus, the orientation of sub-micrometer fibers is not even known commercially available or prepared by an electrostatic melt-blown spinning, but there are known methods to impart molecular orientation preparation methods using these fibers. 然而，Torbin所述的工艺（参见如美国专利No. 4，536，361)没有显示制备分子取向的纤维。 However, Torbin the process (see, e.g., U.S. Pat. No. 4,536,361) fibers made of molecular orientation is not shown. 本发明的复合非织造纤维网可以包含一种或多种细小亚微米纤维组分。  The composite nonwoven fibrous webs of the present invention may comprise one or more fine sub-micrometer fiber component. 在一些实施例中，优选的细小亚微米纤维组分为包含中值纤维直径小于一微米（ym)的纤维的亚微米纤维组分。 In some embodiments, a preferred fine sub-micrometer fiber component is a sub-micrometer fiber component comprises fibers median fiber diameter of less than one micrometer (YM) of. 在一些示例性实施例中，亚微米纤维组分包含中值纤维直径在从约O. 2 μ m到约O. 9 μ m的范围内的纤维。 In some exemplary embodiments, the sub-micrometer fiber component comprises fibers having a median fiber diameter in the range of from about to about O. 2 μ m is O. 9 μ m. 在其它示例性实施例中，亚微米纤维组分包含中值纤维直径在从约O. 5 μ m到约O. 7 μ m的范围内的纤维。 In other exemplary embodiments, the sub-micrometer fiber component comprises fibers having a median fiber diameter of from about O. 5 μ m in the range of O. to about 7 μ m is. 在本发明中，通过以下方式确定给定的亚微米纤维组分中的纤维的“中值纤维直径”:例如通过使用扫描电镜来制备纤维结构的一副或多幅图像；测量所述一副或多幅图像中的清晰可见的纤维的纤维直径，从而得到总数为X的纤维直径；以及计算X个纤维直径的中值纤维直径。  In the present invention, it is determined "median fiber diameter" of a given sub-micrometer fiber component of the fiber in the following manner: for example, one or more images of preparing the fiber structure by using a scanning electron microscope; measurements said one or more images of the fiber diameter of clearly visible fibers, resulting in a total fiber diameter of X; and X is calculated median fiber diameter of a fiber diameter. 通常，X大于约50，并且范围从约50到约200是有利的。 Typically, X is greater than about 50, and ranges from about 50 to about 200 is advantageous. 在一些示例性实施例中，亚微米纤维组分可以包含一种或多种聚合物材料。  In some exemplary embodiments, the sub-micrometer fiber component may comprise one or more polymeric materials. 合适的聚合物材料包括（但不限于）聚烯烃，例如聚丙烯和聚乙烯；聚酯，例如聚对苯二甲酸乙二醇酯和聚对苯二甲酸丁二醇酯；聚酰胺（尼龙-6和尼龙_6，6);聚氨酯；聚丁烯；聚乳酸；聚乙烯醇；聚苯硫醚；聚砜；液晶聚合物；聚乙烯-共-乙酸乙烯酯；聚丙烯腈；环状聚烯烃；聚氧甲烯；多烯键热塑性弹性体；或它们的组合。 Suitable polymeric materials include (but are not limited to) a polyolefin, such as polypropylene and polyethylene; polyesters such as poly (ethylene terephthalate) and poly (butylene terephthalate); polyamides (nylons - 6 and nylon _6,6); polyurethanes; polybutene; polylactic acid; polyvinyl alcohols; polyphenylene sulfide; polysulfone; liquid crystal polymer; polyethylene - co - vinyl acetate; polyacrylonitrile; cyclic poly olefin; polyoxymethylene; multi-ethylenically thermoplastic elastomer; or a combination thereof. 亚微米纤维组分可以包括含有上述聚合物或共聚物中的任何一种的单组分纤维。  The sub-micrometer fiber component may comprise monocomponent fibers comprising any one of the above-described polymers or copolymers of. 在这个示例性实施例中，单组分纤维可以包含下述添加剂，但包含选自上述聚合物材料的单种纤维形成材料。 In this exemplary embodiment, the monocomponent fibers may contain additives as described below, but comprise a single fiber forming polymeric material selected from the above materials. 此外，在该示例性实施例中，如果存在，单组分纤维通常包括至少75重量％的上述聚合物材料中的任何一种以及高达25重量％的一种或多种添加剂。 Further, in the exemplary embodiment, if present, is typically monocomponent fibers comprising any one of at least 75 wt% of said polymeric material and one or more additives of up to 25% by weight. 有利地，单组分纤维包括至少80重量％、更有利地至少85重量％、至少90重量％、至少95重量％以及100重量％之多的上述聚合物材料中的任何一种，其中所有重量都是基于纤维的总重量。 Advantageously, monocomponent fibers comprising at least 80 wt%, more advantageously at least 85%, at least 90% by weight, as much as any of the above polymeric material and at least 95 wt% in 100 wt%, wherein all weight based on the total weight of the fiber. 亚微米纤维组分也可以包含由以下物质形成的多组分纤维：（I)上述聚合物材料中的两种或更多种，和（2)下述一种或多种添加剂。  sub-micrometer fiber component may also comprise multi-component fibers formed from the following materials: two of the above polymeric materials (I) or more, and (2) consists of one or more additives. 如本文所用，术语“多组分纤维”是用于指由两种或更多种聚合物材料形成的纤维。 As used herein, the term "multicomponent fiber" is used to refer to a fiber formed from two or more polymeric materials. 合适的多组分纤维构型包括（但不限于）皮芯构型、并列构型和“海岛”构型。 Suitable multi-component fiber configurations include (but are not limited to a) sheath-core configurations, parallel configurations, and "island" configuration. 对于由多组分纤维形成的亚微米纤维组分，有利地，基于纤维的总重量，多组分纤维包含：（1)从约75重量％到约99重量％的上述聚合物中的两种或更多种，和（2)从约25重量％到约I重量％的一种或多种额外的纤维形成材料。  For sub-micrometer fiber components formed from multi-component fibers, advantageously based on the total weight of the fibers, multicomponent fibers comprising: (1) from about 75 wt% to about 99 wt% of said polymer two or more, and (2) from about 25 wt% to about I weight percent of one or more additional fiber-forming material. 本发明的复合非织造纤维网可以包含一种或多种粗纤维组分，例如微纤维组分。  The present invention a composite nonwoven fibrous web may comprise one or more coarse fiber components such as the micro-fiber component. 在一些实施例中，优选的粗纤维组分为包含中值纤维直径为至少I ym的纤维的微纤维组分。 In some embodiments, a preferred coarse fiber component is a fiber microfiber component comprises at least I ym of the median fiber diameter. 在一些示例性实施例中，微纤维组分包含中值纤维直径为从约2 μ m到约100 μ m的范围内的纤维。 In some exemplary embodiments, the microfiber component comprises fibers median fiber diameter of from about 2 μ m to 100 μ m in a range of about. 在其它示例性实施例中，微纤维组分包含中值纤维直径为从约5 μ m到约50 μ m的范围内的纤维。 In other exemplary embodiments, the microfiber component comprises fibers median fiber diameter of from about 5 μ m in a range of about 50 μ m.
 在本发明中，通过以下方式确定给定的微纤维组分中的纤维的“中值纤维直径”：例如通过使用扫描电镜来制备纤维结构的一副或多幅图像；测量所述一副或多幅图像中的清晰可见的纤维的纤维直径，从而得到总数为X的纤维直径；以及计算X个纤维直径的中值纤维直径。 Prepared, for example one or more images of the fiber structure by using a scanning electron microscope; the measurement:  In the present invention, it determines a given fiber of the microfiber component "median fiber diameter" in the following manner one or more images fiber diameter of clearly visible fibers, resulting in a total fiber diameter of X; and X is calculated median fiber diameter of a fiber diameter. 通常，X大于约50，并且范围从约50到约200是有利的。 Typically, X is greater than about 50, and ranges from about 50 to about 200 is advantageous. 在一些示例性实施例中，微纤维组分可以包含一种或多种聚合物材料。  In some exemplary embodiments, the microfiber component may comprise one or more polymeric materials. 一般来讲，任何形成纤维的聚合物材料均可以用于制备微纤维，尽管通常且优选纤维成形材料是半结晶性的。 Generally, any fiber-forming polymeric material may be used in the preparation of microfiber, though usually and preferably the fiber-forming material is semi-crystalline. 特别可用的是通常用于纤维形成物的聚合物，例如聚乙烯、聚丙烯、聚对苯二甲酸乙二醇酯、尼龙和聚氨酯。 Particularly useful are polymers commonly used in fiber formation such as polyethylene, polypropylene, polyethylene terephthalate, nylon, and polyurethane. 也可以由非晶态聚合物（例如聚苯乙烯）来制备网。 Network may also be prepared from amorphous polymers (e.g., polystyrene). 这里所列的具体聚合物仅为示例，并且多种其它聚合物材料或纤维成形材料为可用的。 Specific polymers listed here are merely examples, and a variety of other polymeric or fiber-forming materials are useful. 合适的聚合物材料包括（但不限于）聚烯烃，例如聚丙烯和聚乙烯；聚酯，例如聚对苯二甲酸乙二醇酯和聚对苯二甲酸丁二醇酯；聚酰胺（尼龙-6和尼龙-6，6);聚氨酯；聚丁烯；聚乳酸；聚乙烯醇；聚苯硫醚；聚砜；液晶聚合物；聚乙烯-共-乙酸乙烯酯；聚丙烯腈；环状聚烯烃；聚氧甲烯；多烯键热塑性弹性体；或它们的组合。  Suitable polymeric materials include (but are not limited to) a polyolefin, such as polypropylene and polyethylene; polyesters such as poly (ethylene terephthalate) and poly (butylene terephthalate); polyamides (nylon-6 and nylon-6,6); polyurethanes; polybutene; polylactic acid; polyvinyl alcohols; polyphenylene sulfide; polysulfone; liquid crystal polymer; polyethylene - co - vinyl acetate; polyacrylonitrile; cyclic polyolefins; polyoxymethylene; multi-ethylenically thermoplastic elastomer; or a combination thereof. 可以利用多种合成纤维成形聚合物材料，包括热塑性塑料，尤其是可延展的热塑性塑料，例如线性低密度聚乙烯（如可以商标名D0WLEX™购自Dow Chemical公司(Midland, Michigan)的那些）、热塑性多烯键弹性体(TPE,如可以商标名ENGAGE™购自Dow Chemical公司（Midland, Michigan)的那些；和可以商标名VISTAMAXX™购自Exxon-Mobil Chemical公司(Houston, Texas)的那些）、乙烯-α -烯经共聚物（如可以商标名EXACT™购自Exxon-Mobil Chemical公司（Houston, Texas)和可以商标名ENGAGE™购自Dow Chemical公司（Midland, Michigan)的乙烯-丁烯、乙烯-己烯或乙烯-辛烯共聚物）、乙烯-醋酸乙烯聚合物（如可以商品名ELVAX™购自EI DuPont deNemours&Co. (Wilmington,Delaware)的那些）、聚丁烯弹性体（如可以商品名CRASTIN™购自EI DuPont de Nemours&Co. (Wilmington, Delaware)和可以商品名POLYBUTENE-l™ 购自Basell Polyolefins (Wilmington, Delaware)的  may utilize a variety of synthetic polymeric molding material comprises a thermoplastic, especially extensible thermoplastics such as linear low density polyethylene (e.g., trade name D0WLEX ™ available from Dow Chemical Co. (Midland, Michigan) of those), the thermoplastic multi-ethylenically elastomer (TPE, such as the trade name ENGAGE ™ available from Dow Chemical Co. (Midland, Michigan) those; and trade name VISTAMAXX ™ available from Exxon-Mobil Chemical company (Houston, Texas) of those), an ethylene [alpha - ene copolymers by (e.g., trade name EXACT ™, available from Exxon-Mobil Chemical company (Houston, Texas) and under the trade name ENGAGE ™ available from Dow Chemical Co. (Midland, Michigan) ethylene - butoxy , ethylene - hexene or ethylene - octene copolymers), ethylene - vinyl acetate polymers (such as available under the tradename ELVAX ™ available from EI DuPont deNemours & Co (Wilmington, Delaware), those), polybutylene elastomers (e.g. tradename CRASTIN ™ available from EI DuPont de Nemours & Co. (Wilmington, Delaware), and the trade name POLYBUTENE-l ™ purchased from Basell Polyolefins (Wilmington, Delaware) of 那些）、弹性体苯乙烯嵌段共聚物（如可以商品名KRAT0N™ 购自Kraton Polymers (Houston, Texas)和可以商品名S0LPRENE™ 购自Dynasol Elastomers (Houston, Texas)的那些）和聚醚嵌段共聚多酰胺弹性体材料（如可以商品名PEBAX™购自Arkema (Colombes, France)的那些)。 Those), elastomeric styrene block copolymer (e.g., trade name KRAT0N ™ available from Kraton Polymers (Houston, Texas) and those S0LPRENE ™ trade name available from Dynasol Elastomers (Houston, Texas)) of polyether block body and copolyamide elastomeric materials (e.g., commercially available under the tradename PEBAX ™ from those Arkema (Colombes, France) in). TPE是尤其优选的。 TPE is particularly preferred. 根据本发明的示例性实施例，也可以将多种天然纤维形成材料制备成非织造微纤维。  According to an exemplary embodiment of the present invention, it may be formed in a variety of natural fiber nonwoven microfiber material as prepared. 优选的天然材料可以包括柏油或浙青（如用于制备碳纤维）。 Preferred natural materials may include bitumen or Zhejiang cyan (such as for the preparation of carbon fibers). 纤维形成材料可以是熔化形式或承载于合适的溶剂中。 Fiber-forming material can be in molten form or carried in a suitable solvent. 也可利用反应性单体，当它们通过或穿过模具时，它们与彼此反应。 Reactive monomer may also be utilized, or when they pass through the die, they react with each other. 非织造纤维网可以将纤维混合物包含在单层（例如使用两个密集间隔的共享通用模具顶端的模具腔体来制备）、多个层（例如使用以叠堆布置的多个模具腔体来制备）或多组分纤维的一层或多层（例如在Krueger等人的美国专利No. 6，057, 256中所述的那些）中。 The nonwoven fibrous web may be in a single layer comprising a mixture of fibers (e.g. prepared using two mold cavities sharing a common die tip closely spaced), a plurality of layers (e.g., using a plurality of mold cavities arranged in a stack prepared ) or one or more component fibers (e.g., Krueger et al., U.S. Pat. No., those) in the 256 in 6,057. 也可以由材料的共混物形成纤维，包括已经某些添加剂已经共混到其中的材料，例如颜料或染料。  fibers may be formed from a blend of materials, including certain additives have been blended into the material therein, such as pigments or dyes. 可以制备例如皮芯型或并列型双组分纤维的双组分微纤维（本文的“双组分”包括具有两个或更多个组分的纤维，每一个组分占据纤维横截面积的一部分并且基本上在纤维的整个长度上延伸），如可以是双组分亚微米纤维。 Can be prepared, for example, sheath-core or side by side bicomponent fibers of bicomponent microfibers ( "bicomponent" herein includes fibers having two or more components, each component occupying a cross-sectional area of ​​the fibers part and extends substantially over the entire length of the fiber), as may be bicomponent sub-micrometer fibers. 然而，本发明的示例性实施例利用单组分纤维可以是特别可用的和有利的（其中纤维在其整个横截面上具有基本相同的组成，但“单组分”包括共混物或包含添加剂的材料，其中基本上均一组成的连续相在整个横截面和纤维长度上延伸）。 However, exemplary embodiments of the present invention using a single-component fibers may be particularly useful and advantageous (wherein the fibers have essentially the same composition throughout its cross-section, but the "one-component" includes blends or additive comprising material, wherein the continuous phase of substantially uniform composition extends across the cross-section and fiber length). 在其它有益效果当中，能够使用单组分纤维降低了制备的复杂性，并且对网的使用限制较少。 Among other beneficial effects, to use a single-component fibers reduces complexity of manufacturing and places fewer restrictions on the use of the network. 除了以上提及的纤维形成材料之外，还可以将多种添加剂添加到熔化并挤出的纤维以将添加剂掺入纤维中。  In addition to the above-mentioned fiber-forming material, various additives may also be added to the fiber melt and extruded to incorporate the additive into the fiber. 通常，基于纤维的总重量，添加剂的量小于约25重量％，有利地高达约5. O重量％。 Typically, based on the total weight of the fiber, the amount of additive is less than about 25% by weight, advantageously up to about 5. O wt%. 合适的添加剂包括（但不限于）颗粒、填充剂、稳定剂、增塑剂、增粘齐IJ、流动控制剂、固化缓聚剂、粘合增进剂（例如硅烷和钛酸盐）、辅助剂、抗冲改性剂、可膨胀的微球体、导热颗粒、导电颗粒、二氧化硅、玻璃、粘土、滑石、颜料、着色剂、玻璃珠或泡、抗氧化剂、荧光增白剂、抗微生物剂、表面活性剂、阻燃剂和含氟化合物。 Suitable additives include (but are not limited to) particles, fillers, stabilizers, plasticizers, tackifying IJ Qi, flow control agents, cure rate retarders, adhesion promoters (e.g., silanes and titanates), adjuvants , impact modifiers, expandable microspheres, thermally conductive particles, electrically conductive particles, silica, glass, clay, talc, pigments, colorants, glass beads or bubbles, antioxidants, optical brighteners, antimicrobial agents , surfactants, flame retardants, and fluorochemicals. 上述添加剂中的一种或多种可以用于减少所得纤维和层的重量和/或成本、调节粘度、或改变纤维的热特性或使衍生自添加剂物理特性活性的物理特性具有一定的范围，包括电学特性、光学特性、与密度相关的特性、与液体阻隔或粘合剂粘着性相关的特性。  A or more of the above additives may be used to reduce the weight and the layer and / or cost, to adjust the viscosity or alter the thermal properties of the fiber or to the physical properties derived from the physical characteristics of the active additive has a certain range, including electrical properties, optical properties, density-related, liquid barrier or adhesive tack related properties. 本发明的复合非织造纤维网还可以包含支承层，例如图ID中示出的示例性多层复合非织造纤维制品40的支承层50。  The present invention a composite nonwoven fibrous web may further comprise a support layer, such as the exemplary multi-layer composite nonwoven fibrous article 40, the support layer 50 shown in FIG. ID. 当支承层存在时，支承层可以提供复合非织造纤维制品强度中的大部分。 When the support layer is present, the support layer may provide most of the strength of the composite nonwoven fiber article. 在一些实施例中，上述亚微米纤维组分往往会具有非常低的强度，并可在正常处理期间被损坏。 In some embodiments, the above-described sub-micrometer fiber component tends to have very low strength, and can be damaged during normal handling. 亚微米纤维组分附接到支承层为亚微米纤维组分增加强度，同时保持低密实度，因此，保持所需的亚微米纤维组分的吸收剂性质。 Sub-micrometer fiber component is attached to the support layer is a sub-micrometer fiber component to increase the strength, while maintaining low density, thus maintaining the desired absorbent properties of the sub-micrometer fiber component. 多层复合非织造纤维网结构也可以提供用于进一步加工的足够的强度，所述进一步加工可以包括（但不限于）将网卷绕成辊形式、从辊移除网、模铸、成褶、折叠、网装固定、织造等等。 Multi-layer composite nonwoven fibrous web structure may also provide sufficient strength for further processing, the further processing may include (but are not limited to) winding the web into roll form, removing the web roll, molding, pleating , folding, stapling, weaving, and the like. 在本发明中可以使用多种支承层。  variety of support layers may be used in the present invention. 合适的支承层包括（但不限于）非织造物、织造物、针织织物、泡沫层、膜、纸质层、背胶层、金属薄片、网片、弹性织物（即上述具有弹性性能的织造、针织或非织造物中的任何者）、开孔网、背胶层或它们的任意组合。 Suitable support layers include (but are not limited to) non-woven, woven, knitted fabric, a foam layer, a film, a paper layer, an adhesive layer, metal foil, mesh, an elastic fabric (i.e., having the above-described woven elastic properties, in any of the knitted or nonwoven), an apertured web, adhesive layer, or any combination thereof. 在一个示例性实施例中，支承层包含聚合物型非织造物。 In one exemplary embodiment, the support layer comprises a polymeric nonwoven fabric. 合适的非织造聚合物织物包括（但不限于）纺粘织物、熔喷织物、短长度纤维（即纤维长度小于约IOOmm的纤维）梳理成网、针刺织物、裂膜网、水刺网、气流短纤维网或它们的组合。 Suitable nonwoven polymeric fabrics include (but are not limited to) spunbond fabrics, meltblown fabrics, staple length fibers (i.e., a fiber length of less than about IOOmm fibers) carded, needled fabric, a split film web, a hydroentangled web, airlaid staple fiber web, or a combination thereof. 在某些示例性实施例中，支承层包含粘结的短纤维网。 In certain exemplary embodiments, the support layer comprises staple fibers bonded. 如下进一步所述，可以使用例如热粘结、粘合剂粘结、粉状粘结剂粘结、水刺法、针刺法、压延或它们的组合来进行粘结。 As described further below, bonding may be performed using, for example thermal bonding, adhesive bonding, powdered binder bonding, hydroentangling, needlepunching, calendering, or a combination thereof. 支承层的基重和厚度可以取决于复合非织造纤维制品的特定的最终用途。  basis weight and layer thickness of the support may depend on the particular end use of the composite nonwoven fibrous article. 在本发明的一些实施例中，理想的是，使复合非织造纤维制品的总基重和/或厚度保持在最小水平。 In some embodiments of the present invention, it is desirable that the total basis weight of the composite nonwoven fibrous article and / or kept to a minimum thickness. 在其它实施例中，给定的应用可能要求最小的总基重和/或厚度。 In other embodiments, a given application may require a minimum total basis weight and / or thickness. 通常，支承层的基重为小于约150gsm。 Typically, the base support layer weight of less than about 150gsm. 在一些实施例中，支承层的基重为从约5. Ogsm到约lOOgsm。 In some embodiments, the support layer basis weight is from about to about 5. Ogsm lOOgsm. 在其它实施例中，支承层的基重为从约IOgsm到约75gsm。 In other embodiments, the support layer basis weight is from about IOgsm to about 75gsm. I. Omm到约35mm。 I. Omm to about 35mm. 在其它实施例中，支承层的厚度为从约2. Omm到约25mm。 In other embodiments, the thickness of the support layer is from about 2. Omm to about 25mm. 在某些示例性实施例中，支承层可以包含微纤维组分，例如多个微纤维。  In certain exemplary embodiments, the support layer may comprise a microfiber component, for example, a plurality of microfibers. 在这种实施例中，可能优选的是，将上述亚微米纤维组直接沉积到微纤维支承层上以形成多层复合非织造纤维网。 In such embodiments, it may be preferred that the above-described sub-micrometer fiber population directly deposited onto the microfiber support layer to form a multi-layer composite nonwoven fibrous web. 可任选地是，上述微纤维组可与亚微米纤维组一起沉积在微纤维支承层上或沉积在微纤维支承层上的亚微米纤维组的上方。 Optionally, the above-described microfiber population may be deposited with a sub-micrometer fibers above the sub-micrometer fibers on the microfiber support layer on the microfiber support layer or deposition. 在某些示例性实施例中，构成支承层的多个微纤维在组成上与形成覆盖层的该组微纤维相同。 The same set of microfibers In certain exemplary embodiments, a plurality of micro fibers constituting the support layer and the covering layer in composition. 亚微米纤维组分可以被永久性地或暂时性地粘结到给定的支承层。  sub-micrometer fiber component may be permanently or temporarily bonded to a given support layer. 在本发明的一些实施例中，亚微米纤维组分被永久性地粘结到支承层（即亚微米纤维组分被附接到支承层，旨在永久性地被粘结到支承层）。 In some embodiments of the present invention, the sub-micrometer fiber component is permanently bonded to the support layer (i.e. sub-micrometer fiber component is attached to the support layer, intended to be permanently adhered to the support layer). 在本发明的一些实施例中，上述亚微米纤维组分可以被暂时性地粘结到（如可从其移除）支承层（例如隔离衬垫）。  In some embodiments of the present invention, the above-described sub-micrometer fiber component may be temporarily bonded to (e.g., removable from) a support layer (e.g., release liner). 在这种实施例中，可以使亚微米纤维组分在暂时支承层上支承所需的时间长度，可任选地是，可以在暂时支承层上进一步对亚微米纤维组分进行处理，随后将亚微米纤维组分永久性地粘结到第二支承层。 In such embodiments, sub-micrometer fiber component may be supported so that the length of time required on a temporary support layer may optionally, be further sub-micrometer fiber component is processed on a temporary support layer, followed by sub-micrometer fiber component is permanently bonded to a second support layer. 在本发明的一个示例性实施例中，支承层包括含有聚丙烯纤维的纺粘织物。  In one exemplary embodiment of the present invention, the support layer comprises a spunbonded fabric comprising polypropylene fibers. 在本发明的另外的示例性实施例中，支承层包含短长度纤维梳理成网，其中短长度纤维包括：(i)低熔点或粘结纤维；和（ii)高熔点或结构纤维。 In a further exemplary embodiment of the present invention, the support layer comprises a carded web of staple length fibers wherein the staple length fibers comprise: (i) low-melting point or binder fibers; and (ii) a high melting point or structural fibers. 通常，虽然粘结纤维和结构纤维的熔点之差可以大于10°c，但粘结纤维的熔点小于结构纤维的熔点至少10°C。 Typically, although the difference between the melting point of the binder fibers and structural fibers may be greater than 10 ° c, but the melting point of the binder fibers than the melting point of the structural fibers of at least 10 ° C. 合适的粘结纤维包括（但不限于）上述聚合物纤维中的任何者。 Suitable binder fibers include (but are not limited to) any of the above-described polymer fiber's. 合适的结构纤维包括（但不限于）上述聚合物纤维以及无机纤维（例如陶瓷纤维、玻璃纤维和金属纤维）和有机纤维（例如纤维素纤维）中的任何者。 Suitable structural fibers include (but are not limited to) any of the above are inorganic fibers and polymeric fibers (such as ceramic fibers, glass fibers and metal fibers) and organic fibers (e.g. cellulose fiber) was added. 7. 62 cm)。 7. 62 cm). 如上所述，支承层可以包含彼此结合的一层或多层。  As described above, the support layer may comprise one or more layers bonded to each other. 在一个示例性实施例中，支承层包含第一层（例如非织造物或膜）和第一层上与亚微米纤维组分相背的粘合剂层。 In one exemplary embodiment, the support layer comprises a first layer (e.g., nonwoven or film) and the first layer opposite the sub-micrometer fiber component of the adhesive layer. 在这个实施例中，粘合剂层可覆盖第一层的一部分或整个外表面。 In this embodiment, the adhesive layer may cover a portion of or the entire outer surface of the first layer. 粘合剂可以包含任何已知的粘合剂，包括压敏粘合剂、可热激活粘合剂等。 The adhesive may comprise any known adhesive, including pressure sensitive adhesives, heat activatable adhesive or the like. 当粘合剂层包含压敏粘合剂时，复合非织造纤维制品还可以包含隔离衬垫，从而得到压敏粘合剂的暂时保护。 When the adhesive layer comprises a pressure sensitive adhesive, the composite nonwoven fibrous article may further comprise a release liner, to obtain a temporary protection of the pressure-sensitive adhesive. 本发明的复合非织造纤维网可以包含与颗粒加载的纤维层、任选支承层或上述两者结合的额外的层（图中未示出）。  The present invention a composite nonwoven fibrous web may comprise fibers of the layer and the particle loading, support layer optionally additional layers or both in combination (not shown). 合适的额外的层包括（但不限于）包含颜色的层（如印刷层）；上述支承层中的任何者；具有明显不同的平均纤维直径和/或物理组成的一种或多种额外的亚微米纤维组分；用于额外的隔离性能的一种或多种次细小亚微米纤维层（例如熔喷网或玻璃纤维织物）；泡沫；粒子层;金属薄片层;膜；装饰织物层；隔膜（即具有受控渗透性的膜，例如透析膜、反渗透膜等）；结网；网片；布线网或管网（即用于传输电的线层或用于传输多种流体的管组，例如用于加热毯的布线网和使冷却剂流经冷却毯的管网）；或它们的组合。  Suitable additional layers include (but are not limited to) a color layer (printed layer); and the support layer by any; one composition having a distinct average fiber diameter and / or physical or more additional sub-micrometer fiber component; for an additional barrier properties or more secondary fine sub-micrometer fiber layer (e.g., a meltblown web or a glass fiber fabric); foams; particle layer; a metal foil layer; film; decorative fabric layer; a separator (i.e., a film having a controlled permeability, such as dialysis membranes, reverse osmosis membrane); netting; mesh; wire mesh or network (i.e., a transmission line layer for transmitting electrical or more fluids tubing set, for example, wire mesh and a blanket for heating the coolant flowing through the cooling blanket network); or combinations thereof. 在某些示例性实施例中，本发明的复合非织造纤维网还可以包含一种或多种附接装置，以允许将复合非织造纤维制品能够附接到基底。  In certain exemplary embodiments, the composite nonwoven fibrous web of the present invention may further comprise one or more attachment means, to allow the composite nonwoven fibrous article to be attached to a substrate. 如上所述，粘合剂可以用于附接复合非织造纤维制品。 As described above, the adhesive may be used to attach the composite nonwoven fibrous article. 除了粘合剂外，还可以使用其他附接装置。 In addition to the binder, it may also be used other attachment means. 合适的附接装置包括（但不限于）任何机械紧固件，例如螺杆、钉子、夹片、U形钉、缝合针、螺纹、钩环材料等。 Suitable attachment means include (without limitation) any mechanical fasteners, such as screws, nails, clips, U-shaped staples, suture needle, thread, hook and loop materials. 一个或多个附接装置可以用来将复合非织造纤维制品附接到多个基底。  One or more attachment means may be used to attach the composite nonwoven fibrous article to a plurality of substrates. 示例性基板包括（但不限于）车辆部件；车辆内部（即客厢、发动机舱、行李箱等）；建筑物壁（即内壁表面或外壁表面）；建筑物天花板（即内天花板表面或外天花板表面）；用于形成建筑物壁或天花板的建筑材料（如天花板贴片、木材部件、石膏板等）；隔间；金属薄片；玻璃基板；门；窗；机械部件；器具元件（即器具内表面或器具外表面）；管道或软管的表面；计算机或电子元件；声音记录或复制装置；用于器具、电脑等的外壳或箱体。 Exemplary substrates include (but are not limited to) members of the vehicle; a vehicle interior (i.e. the passenger compartment, engine compartment, trunk, etc. ); building wall (i.e. the inner wall surface or exterior wall surface); ceiling of a building (i.e., interior ceiling surface or exterior ceiling surface); means for forming a wall or ceiling of a building construction materials (e.g., ceiling tile, wood component, gypsum board, etc. ); compartment; metal foil; glass substrates; doors; windows; mechanical member; tool elements (i.e., within the appliance appliance surface or exterior surface); pipe or hose surface; a computer or electronic component; a sound recording or reproducing apparatus; for appliances, computers, housing or casing. 颗粒加载的复合非织造纤维网是已知的。  The composite particle loaded nonwoven webs are known. 用于生成颗粒加载的非织造纤维网的已知方法一般要求非织造纤维网自身具有用于支承结合非织造/颗粒系统的足够的强度和物理特性。 Nonwoven webs known method for generating a particle-loaded nonwoven web generally require itself has sufficient strength for supporting the binding and physical characteristics of the nonwoven / particles system. 如果对于特定应用，非织造网没有用于支承颗粒的足够的强度或硬度，则已知方法极不凑效。 If there is no sufficient strength for supporting the hardness of the particles, or for a particular application, the nonwoven web, the known method is not very ridiculous. 由于在形成颗粒系统之后将纤维掺杂在粘结颗粒系统内是非常困难的，所以制备粘结的颗粒加载的纤维网也有问题。 Since the system after formation of the particles within the doped fiber bonded particulate system is very difficult, so the particle loaded web of the bonded also a problem. 本发明的某些示例性实施例可以通过形成下述复合非织造纤维网来克服这个问题，在所述复合非织造纤维网中，在将非织造纤维与颗粒相互缠结以形成复合非织造纤维网之前，颗粒形成基本上连续的三维网。  Certain exemplary embodiments of the present invention can overcome this problem by forming a composite nonwoven fibrous web below, the composite nonwoven fibrous web, the fibrous nonwoven entangled with each other to form a composite particle before nonwoven web, the particles form a substantially continuous three-dimensional network. 在某些实施例中，这种复合非织造纤维网不依赖于非织造纤维网的物理特性来支承颗粒加载的非织造纤维网的结合结构。 In certain embodiments, the composite nonwoven fibrous web does not depend on the physical properties of the nonwoven web to support the binding nonwoven fibrous web particle loading. 通过首先将一组颗粒形成基本上连续的三维网，可以避免在将纤维自身粘结或粘结到颗粒时所产生的问题。  problems in the fibers themselves adhered or bonded to the particles produced by a first set of particles form a substantially continuous three-dimensional network, it can be avoided. 特别是，直径非常小的纤维（如亚微米纤维）或天然的脆弱或不连续的纤维通常生成强度非常小的粘结性差的网。 In particular, very small diameter fibers (e.g., sub-micrometer fibers) or natural fibers or discontinuous frangible typically generate very little strength poor adhesion network. 制备这种脆弱网的方法的实例包括熔喷、Torobin方法和一些商品形式的气流成网法。 Examples of methods for preparing such frangible webs include meltblown, Torobin methods, and some commercial forms of air-laying. 使用强度不是很高的颗粒纤维也可以提供优于使用强度较高的纤维的优点。  The particles used is not very high strength fibers may also provide advantages over the use of high strength fibers. 由于亚微米纤维和超细微纤维的本身的脆弱性质，所以它们提供非常高的比表面积，非常高的比表面积对例如过滤和隔离这样的应用有利。 Due to the fragile nature of the sub-micrometer fibers and ultrafine fibers themselves, they provide very high specific surface area, very high specific surface area of ​​such advantageous applications such as filtration and isolation. 主要由于直径小的纤维（如亚微米纤维和超细微纤维）的脆弱性，所以它们也具有压碎成较高密度结构的较大趋势。 Mainly due to the vulnerability of small diameter fibers (e.g., sub-micrometer fibers and ultrafine fibers), they have a greater tendency to crush higher density structure. 通过形成分散在整个成品网中的连续颗粒嵌入相，可支承脆弱的纤维，并可以避免过度压紧。 By continuously forming the particles dispersed throughout the finished mat is embedded in the phase, may support the fragile fiber, and to avoid excessive compression. 与密度较高的网相比，密度较低的细小纤维网一般会显示具有较低的压降，同时由于直径不变而仍显示具有大的比表面积。 Compared to higher network density, low density fine webs typically exhibit lower pressure drop, and because a constant diameter and still exhibit a large specific surface area. 这种密度较低的结构也可以使被纤维或其它颗粒填塞的颗粒表面的量最小化。 Such low density structure may be that the amount of the particle surface is packed fibers or other particles is minimized. 因此，在另一方面，本发明提供制备复合非织造纤维网的方法，该方法包括：形成嵌入相，嵌入相具有基本上连续的三维网中的一组颗粒；和形成基质相，基质相包含围绕颗粒形成三维网的一组纤维。  Thus, in another aspect, the present invention provides a method of making a composite nonwoven fibrous web, the method comprising: forming an embedded phase, fitted with a set of particles having a substantially continuous three-dimensional network; and a matrix phase is formed, the matrix phase comprising a population of fibers forming a three-dimensional network around the particles. 在某些示例性实施例中，可以通过生成颗粒流并将该颗粒流与气载纤维流结合来进行用于形成根据本发明的复合非织造纤维网的处理。  In certain exemplary embodiments, and the particle stream may be airborne fiber stream and combination process for forming a nonwoven web in accordance with the present invention by generating a composite particle stream. 然后可以将结合的流收集到网中。 The combined stream may then be collected into the network. 在一些示例性实施例中，可以在混合或收集处理期间或在单独的处理步骤中将颗粒粘结到纤维。 In some exemplary embodiments, or it may be a separate process step in the particles adhered to the fibers during the mixing process or collection. 已知用于将颗粒流添加到非织造纤维流的多种方法。  known for adding a plurality of particle flow to a nonwoven fiber stream. 在美国专利No. 4，118，531 (Hauser)、No. 6，872，311 (Koslow)和No. 6，494，974 (Riddell)中以及在美国专利申请公布No. 2005/0266760 (Chhabra 和Isele)、No. 2005/0287891 (Park)和No. 2006/0096911 (Brey等人）中描述了合适的方法。 (Riddell) in US Patent No. 4,118,531 (Hauser), No. 6,872,311 (Koslow) and No. 6,494,974 and the publication No. 2005/0266760 (Chhabra and patent applications in the US Isele), No. 2005/0287891 (Park), and No. 2006/0096911 (Brey et al) describes a suitable method. 本申请人已经发现的是，通过首先在基本上连续的三维网中形成一组颗粒，可以避免当将颗粒流与纤维流结合时将纤维自身粘结或将纤维粘结到颗粒时所产生的问题。 The Applicant has found that when a group of particles by first forming a substantially continuous three-dimensional network of particles can be avoided when the combined flow stream with the fibers, the fibers bonded to itself or to bond the fibers to the granules produced when problem. 优选地，在将颗粒嵌入在非织造纤维流中以形成非织造纤维网之前，将颗粒粘结在一起以形成基本上连续的三维网。 Preferably, the particles are embedded prior to the nonwoven fiber stream to form a nonwoven web, the particles are bonded together to form a substantially continuous three-dimensional network. 在一些示例性实施例中，在将非织造纤维与颗粒相互缠结以形成复合非织造纤维网之前，将颗粒粘结在一起以形成基本上连续的三维网。  In some exemplary embodiments, before the nonwoven fibrous entangled with each other to form a composite particle nonwoven fibrous web, the particles are bonded together to form a substantially continuous three-dimensional network. 在某些示例性实施例中，可以利用热量、压力、溶剂、粘合剂、辐射（如通过颗粒的固化性组分的辐射固化）、缠结、振动等等实现颗粒粘结。 In certain exemplary embodiments, it is possible using heat, pressure, solvents, adhesives, radiation (e.g., curable by radiation curing of composite particles), entanglement, vibration or the like particles to achieve bonding. 在某些示例性实施例中，可以在网内（例如轴向或径向）形成颗粒密度梯度。  In certain exemplary embodiments, the particle density gradient can be formed in the network (e.g., axial or radial). 轴向形成颗粒密度梯度意指沿着与网厚度方向垂直的方向上的网长度，在网的一端处的每平方面积的颗粒量与在另一端处的量不同。 Mean particle density gradient is formed axially along the web length in the direction perpendicular to the direction of web thickness, the amount of particles per square at one end of the web with different amounts at the other end. 另一方面，径向的颗粒密度梯度（如当将网旋拧成基本圆柱形时）意指颗粒量沿着网的径向（如厚度）方向有差别。 On the other hand, the radial gradient of the particle density (e.g., when the spin-twisted substantially cylindrical mesh) means the amount of particles along a radial web (such as thickness) direction of the difference. 密度（如基于数量、重量或体积的颗粒、吸附剂或纤维组浓度）的变化不必是线性的，而是可根据需要而有差别。  Density (e.g., based on the number, weight or volume of particles, fibers, or groups adsorbent concentration) changes need not be linear, but may be differentiated according to need. 例如，密度可随着轴向或径向梯度、网的整个厚度上增加或减小数量浓度梯度、从靠近厚度方向上的网中心线的峰值减小为限定网厚度的一个或两个主表面附近的较低值的数量浓度梯度而以单阶跃变化、多阶跃变化、正弦的方式而有差别。 For example, with axial or radial density gradients, across the thickness of the web to increase or decrease the number of concentration gradient decreases from the peak in the network close to the centerline of the thickness direction or both major surfaces defining a thickness of the web number concentration gradient near the lower value of the change in a single step, multi-step change, a difference sinusoidal manner. 合适的纤维流（由其制备根据本发明的复合非织造纤维网)包括生成非织造纤维的已知方法以及提供将形成为基本上连续的三维网的颗粒与在纤维网形成处理期间形成的纤维流结合的机会的任何其它方法。 During the  Suitable fiber flows (prepared therefrom The composite nonwoven fibrous webs of the invention) comprises generating a known method and to provide a nonwoven formation process of forming a substantially continuous three-dimensional network of particles in the web any other method of binding fibers chance stream. 在某些示例性实施例中，纤维流可以包含亚微米纤维、微纤维或亚微米纤维和微纤维的共混物。 In certain exemplary embodiments, the fiber stream may comprise sub-micrometer fibers, microfibers or blends of sub-micrometer fibers and microfibers. 许多处理可以用于制备亚微米纤维流，包括（但不限于）熔喷、熔体纺丝、静电纺纱、气体射流原纤化或它们的组合。  treatment may be used to prepare a number of sub-micrometer fiber stream, including (but not limited to) melt blowing, melt spinning, electrospinning, gas jet fibrillation, or combination thereof. 特别合适的方法包括（但不限于）在美国专利No. 3, 874, 886 (Levecque 等人）、No. 4, 363, 646 (Torobin)、No. 4, 536, 361 (Torobin)、No. 5，227，107 (Dickenson 等人）、No. 6，183，670 (Torobin)、No. 6，269，513 (Torobin)、No. 6，315，806 (Torobin)、No. 6，743，273 (Chung 等人)、No. 6，800，226 (Gerking)、德国专利DE 19929709C2 (Gerking)和PCT 申请公布No. WO 2007/001990A2 (Krause 等人）中所公开的方法。 Particularly suitable methods include (without limitation) in U.S. Patent No. 3, 874, 886 (Levecque et al. ), No. 4, 363, 646 (Torobin), No. 4, 536, 361 (Torobin), No. 5,227,107 (Dickenson et al. ), No. 6,183,670 (Torobin), No. 6,269,513 (Torobin), No. 6,315,806 (Torobin), No. 6,743, 273 (Chung et al), No. 6,800,226 (Gerking), German Patent DE 19929709C2 (Gerking) and the method of PCT application Publication No. WO 2007 / 001990A2 (Krause et al.) disclosed. 合适的用于形成亚微米纤维的方法也包括静电纺纱法，例如在美国专利No. I, 975, 504 (Formhals)中所述的那些方法。 Method  suitable for forming sub-micrometer fibers also include electrospinning method, for example, in U.S. Pat. No. I, 975, those 504 (Formhals) in the. 在美国专利No. 6, 114, 017 (Fabbricante 等人）、No. 6，382，526B1 (Reneker 等人)和No. 6，861，025B2 (Erickson 等人)中描述了其它合适的用于形成亚微米纤维的方法。 In U.S. Patent No. 6, 114, 017 (Fabbricante et al. ), No. 6,382,526B1 (Reneker et al.) And No. 6,861,025B2 (Erickson et al.) Describes other suitable for forming a method of sub-micrometer fibers. 许多方法也可以用于制备微纤维流，包括（但不限于）熔喷、熔体纺丝、原丝挤出、丛丝形成、纺粘法、湿纺丝、干纺丝或它们的组合。  Many methods may be used for preparing micro fiber stream, including (but not limited to) melt blowing, melt spinning, extruding filaments, plexifilament formation, spunbonding, wet spinning, dry spinning, or The combination. 在美国专利No. 6，315，806 (Torobin)、No.6, 114,017 (Fabbricante 等人）、No.6，382，526B I (Reneker 等人）和No. 6, 861, 025B2 (Erickson等人）中描述了合适的用于形成微纤维的方法。 In U.S. Pat. No. 6,315,806 (Torobin), No.6, 114,017 (Fabbricante et al. ), No.6,382,526B I (Reneker et al.) And No. 6, 861, 025B2 (Erickson et al. ) describe a suitable method for forming microfibers. 或者，可以使用例如美国专利No. 4, 118, 531 (Hauser)中所述的方法,将一组微纤维形成或转变为短纤维，并将其与一组亚微米纤维结合。 Alternatively, for example, U.S. Pat. No. 4, 118, 531 (Hauser) according to the method, a set of microfibers formed or converted to staple fibers and combined with a population of sub-micrometer fibers. 在一些示例性实施例中，制备复合非织造纤维网的方法包括：通过混合纤维流、水刺法、湿法形成、丛丝形成或它们的组合来将粗微纤维组与细小微纤维组、超细微纤维组或亚微米纤维组结合。  In some exemplary embodiments, the method of making a composite nonwoven fibrous web comprising: mixing fiber streams, hydroentangling, wet forming, plexifilament formation, or a combination thereof to the fine and coarse micro fiber population fiber groups, ultrafine or sub-micrometer fibers of the fiber group binding group. 在将粗微纤维组与细小、超细或亚微米纤维组结合时，可以使用一种或两种类型的多个纤维流，并可按任何顺序结合这些纤维流。 In crude and fine microfibers, ultrafine or sub-micrometer fibers when combined, the plurality of fibers may be used one or two types of streams, and these fibers may be combined in any order streams. 这样，可以形成非织造复合纤维网，从而显示具有多种所需的浓度梯度和/或分层结构。 In this manner, nonwoven composite fibrous web formed thereby exhibit various desired concentration gradients and / or layered structure. 例如，在某些示例性实施例中，可将该组细小、超细或亚微米纤维与该组粗微纤维结合以形成不均一的纤维混合物。  For example, in certain exemplary embodiments, the set may be fine, ultrafine or sub-micrometer fibers are combined with the set of crude microfibers to form an inhomogenous mixture of fibers of. 在某些示例性实施例中，将该组细小、超细或亚微米纤维的至少一部分与该组微纤维的至少一部分混合。 In certain exemplary embodiments, the population of fine, mixing at least a portion of at least a portion of the microfibers of ultrafine or sub-micrometer fibers. 在其它示例性实施例中，可将该组细小、超细或亚微米纤维形成为包含该组微纤维的垫层上的覆盖层。 In other exemplary embodiments, the set may be fine, ultrafine or sub-micrometer fibers is formed on the underlayer comprising microfibers of the cover layer. 在某些其它示例性实施例中，可将该组微纤维形成为包含该组细小、超细或亚微米纤维的垫层上的覆盖层。 In certain other exemplary embodiments, the microfibers may be formed as a group including the fine, the covering layer on an underlayer of ultrafine or sub-micrometer fibers. 在其它示例性实施例中，与形成混合的原丝气流相反，可以操作两个或更多个纤维形成模具以形成单独的层。  In other exemplary embodiments, the gas stream to form a mixed strand contrary, may operate two or more fiber-forming mold to form a separate layer. 当元件横越在旋转轴柄上时，模具也可并列操作以形成不同的分层效果。 When the element traverses on the rotating mandrel, the mold may operate in parallel to form different layered effect. 可以通过在模具中的一个或多个中使用不同的聚合物或多组分纤维进行额外的性能改变。 Additional properties may be altered by one or more in a mold used in different polymer or multicomponent fibers. 也可以使用推进收集器轴柄使粒子加载器将颗粒仅添加到网的目标区域来形成梯度或均匀分层的过滤元件。  may also be used to promote particle collector mandrel loading will cause the particles to the target area network only added to form a uniform or gradient layered filter element. 这可通过与较宽的模具接合使用狭窄的粒子加载器或通过在粒子加载器中使用图案化进料辊而实现。 This may be achieved by engagement with the wider use of narrow particle loader mold or by using a patterned feed roll in the particle loader. 进料辊使用机加工的腔体来控制辊相对于刮粉刀翻转时的体积进料速率。 Feed rollers using machined cavities to control the volume of the feed roller with respect to the rate at which the doctor blade flip. 通过改变进料辊的整个面上（或周围）的腔体体积，可控制颗粒的局部进料，因此，控制所得的网中局部增加的颗粒重量。 By changing the cavity volume of the entire surface of the feed roll (or around), the feed particles can be controlled locally, so that locally control the resulting increase in net weight of the particles. 另一种方法是在粒子加载器中使用分段料斗。 Another method  using a segmented hopper in the particle loader. 将颗粒仅添加到想进行进料的分段区域。 The particles were added to a staging area only want to feed. 这种方法也会允许在分段区域中使用不同的粒子，以允许使用两种粒子尺寸或控制处理过的吸附剂或具有特殊性能的吸附剂的添加。 This approach also allows the use of different particles in the segmented regions to allow the use of two particle sizes or controlling the addition of the adsorbent or adsorbent-treated with special properties. 多个粒子加载器可用于改变加载到目标区域中的粒子的量或类型。 Loading a plurality of particles may be used to change the amount or type of particle loaded into the target area. 通过使用这些方法，可以形成为特定应用而定制的直接形成的复合非织造纤维网。  By using these methods, it may be formed for specific applications tailored composite nonwoven fibrous web is formed directly. 例如，细小聚丙烯纤维的内层可形成为与有助于减少坍陷和脱落的轴柄芯直接相邻。 For example, an inner layer of fine polypropylene fibers can be formed with the help reduce sloughing and shedding shank directly adjacent the core. 可紧邻内层设置用于一次分离的粒子加载的网的中间层。 It may be provided for the inner layer adjacent to the primary separation of particles loaded intermediate layer web. 另外，在中间层上，可形成所需的功能的外层，例如外层可具有较大的孔尺寸以在到达一次分离层之前移除较大的污染物和/或具有较大直径的纤维以充当额外的预过滤层。 Further, on the intermediate layer, the outer layer of desired functionality can be formed, for example, the outer layer may have a larger pore size to remove larger contaminants and / or fibers having a larger diameter before reaching the primary separation layer to act as additional pre-filter layer. 本领域的技术人员也可实现许多其它可以的布置方式，预计这些布置方式将落在本发明的范围内。 Those skilled in the art may also be implemented in many other arrangements can be expected that these arrangements fall within the scope of the present invention. 在收集期间，根据纤维的状况和微纤维和亚微米纤维的相对比率，在纤维和颗粒之间以及纤维本身之间可以进行一些粘结。  During the collection, depending on the condition of the fibers and the relative ratio of sub-micrometer fibers and microfibers is, in and between the fibers and particles between the fibers themselves can make some bonding. 然而，可能理想的是在收集的网中在纤维和颗粒或纤维本身之间进行进一步粘结，从而得到所需的抱合力的基质，从而使网更可处理且能够更好地将任何亚微米纤维保持在基质内（“粘结”纤维本身意指将纤维牢固粘附在一起，因此，当网经受正常处理时纤维一般不会分离）。 However, it may be desirable to further bond between the fibers and the particles or the fibers themselves in the collected web to give the desired cohesion of the matrix, so that the web can be further processed and may be any better submicron fibers held within the matrix ( "bonding" is meant the fibers of the fiber itself firmly adhered together, thus, the fibers generally do not separate when the web is subjected to normal handling). 在某些示例性实施例中，可以将微纤维和亚微米纤维的共混物粘结在一起。  In certain exemplary embodiments, the adhesive may be a blend of micro fibers and sub-micrometer fibers together. 例如，可以使用热粘结、粘合剂粘结、粉状粘结剂、水刺法、针刺法、压延或它们的组合而实现粘结。 For example, thermal bonding, adhesive bonding, powdered binder, hydroentangling, needlepunching, calendering, or a combination thereof and effect bonding. 可使用在点粘结工艺中施加热和压力或通过平滑压延辊的常规粘结技术，但此类工艺可能引起不期望的纤维变形或网压缩。 Applying heat and pressure may be used in point-bonding process or by smooth calender rolls conventional bonding techniques, but such processes may cause undesired deformation of fibers or web compression. 在美国专利申请公布No. 2008/0038976A1中公开了更加优选的用于粘结纤维、特别是微纤维的技术。 In U.S. Patent Application Publication No. 2008 / 0038976A1 discloses a more preferred method for bonding fibers, particularly microfibers in the art. (10)通过粘合剂或包括（但不限于）夹片、托架、螺栓/螺杆、钉子和条带的任何其他附接装置将复合非织造纤维网附接到另一基板。  (10) by adhesive or including (but not limited to) clips, any other attachment means bracket, bolts / screws, nails and strips the composite nonwoven fibrous web attached to the other substrate. 参见图2，该图示出用于制备根据本发明的复合非织造纤维网的设备300的一个示例性实施例的示意图。  Referring to Figure 2, which shows a schematic view of an exemplary embodiment for the preparation of the composite apparatus embodiment of the present invention according to a nonwoven fibrous web 300. 图2示出用于制备非织造颗粒加载的网的颗粒加载设备60。 Figure 2 shows a particle loading apparatus 60 for making nonwoven particle network loading. 颗粒74通过料斗76，穿过进料辊78和刮粉刀80。 Particles 7476 passing through the feed roller 78 and the doctor blade 80 through a hopper. 电动刷辊82使进料辊78旋转。 Electric brush roller 82 so that rotation of the feed rollers 78. 可使螺纹调整器84移动以改进幅材横向均匀度和通过进料辊78的颗粒渗漏速率。 Adjustment screw 84 can move in order to improve cross-web uniformity and through the feed rollers 78 of the leak rate of particles. 总颗粒流速可通过改变进料辊78的旋转速率来调整。 The total flow rate of the particles by varying the rate of rotation of the feed rollers 78 can be adjusted. 可以改变进料辊78的表面以优化用于不同颗粒的进料性能。 Feed rollers may be varied to optimize the surface 78 of the feed performance for different particles. 颗粒74的瀑布状物86从进料辊78穿过斜槽88落下，并移出沟槽94，从而形成颗粒流96。 86 particles was 74 falls through chute 88 fall from a feed roller 78, and out of the grooves 94, 96 so that the particle stream is formed. 颗粒流96形成基本上连续的三维网14中的一组颗粒。  particle stream 96 is formed of a set of particles 14 in a substantially continuous three-dimensional network. 在某些优选实施例中，粘结这些颗粒的至少一部分以形成基本上连续的三维网。 In certain preferred embodiments, at least a portion of the bonding of the particles to form a substantially continuous three-dimensional network. 可使用例如热量、压力、溶剂、粘合齐U、辐射、振动、缠结等等而实现颗粒之间的粘结。 E.g. heat, pressure, solvents, bonding together U, radiation, vibration, etc. to achieve entanglement bonding between the particles may be used. 图2示出一个目前优选的实施例，在该实施例中，颗粒流96包含热塑性聚合物颗粒，并且通过加热粘结颗粒使颗粒表面软化。 Figure 2 illustrates a presently preferred embodiment, in this embodiment, the particle stream 96 comprising a thermoplastic polymer particles, bonding the particles by heating the particles to soften the surface. 可以通过使用任何手段（例如使用从任选加热元件102和/或102'流出的热空气流）进行加热。 It may be (e.g., using heat and / or 'hot air flow coming out of element 102, optionally 102) by use of any means of heating. 如图2整体所示，从纤维形成设备101流出的纤维流100拦截颗粒流96。  As shown in FIG 2 as a whole, the device 101 exiting the fiber stream 100 is formed from the fiber stream to intercept particles 96. 如图2中虚线所示，可从任选纤维形成模具IOla将任选第二纤维流IOOa引入颗粒流96中。 2 in dotted lines, may be formed in an optional second mold IOla IOOa fiber stream 96 is introduced from the particle stream optionally fibers. 这些纤维流在经过距离21时合并，并变成在收集设备3上沉积为复合非织造纤维网10'。 These streams are combined in the fiber over a distance 21, and becomes deposited on the collection apparatus 3 as a composite nonwoven fibrous web 10 '. 本发明的示例性实施例可以通过以下方式来实施：在连续筛网型收集器（例如图2所示的带型收集器19)上、在筛网覆盖筒（未示出）上或使用本领域已知的替代方法来收集复合非织造纤维网10'。  Exemplary embodiments of the present invention may be implemented in the following way: In the continuous screen-type collector (e.g., as shown in FIG. 2 type collector belt 19), in a screen-covered drum (not shown) or to collect a composite nonwoven fibrous web 10 'using alternative methods known in the art. 可以将复合非织造纤维网10'卷绕成卷23。 May be a composite nonwoven fibrous web 10 'is wound into a roll 23. 在图2中示出的某些示例性实施例，复合非织造纤维网1(V可以被移动收集器19承载于受控加热装置200下方，受控加热装置200安装在收集器19上方。在示例性加热装置200中，将受热空气（通过空气导管207供应给加热装置200)的细长或刀状流210吹到在加热装置200下方的收集器19上移动的复合非织造纤维网10'上。  In certain exemplary embodiments FIG. 2 embodiment illustrated, the composite nonwoven fibrous web 1 (V collector 19 may be moved to a controlled heating means below the carrier 200, controlled heating means 200 mounted in collector 19 above. in the exemplary heating device 200, the heated air (supplied through air conduit 207 to heating means 200) is an elongated or knife-like stream 210 is blown in the heating device 19 moves on the collector 200 beneath the composite nonwoven fibrous network 10 '. 大量空气穿过微纤维形成设备，当纤维在区域215中到达收集器时，必须对这些空气进行处置。  large amount of air passing through the micro fibers forming apparatus, when the fibers reach the collector in the region 215, the air must be disposed of. 排气装置214优选充分延伸以位于加热装置200的狭槽209下方（以及如下所述，沿着幅材纵向延伸距离218超过受热的流210并穿过标记为220的区域）。 Exhaust means 214 preferably extends sufficiently to the heating apparatus 200 of the slot 209 below (and as described below, extends longitudinally along the web 210 and from the region labeled 220 through 218 over a heated stream). 足够的空气穿过区216中的网和收集器以使网在多种处理空气流下保持在适当的位置上。 Sufficient air passes through the region 216 and the collector of the network so that the network in a variety of process air flow is maintained at an appropriate position. 在热处理区217下部的板中的足够的开度允许处理空气穿过网，同时提供足够的阻力以保证空气的均匀分配。 A sufficient degree of opening in a lower portion of the plate 217 allows the heat treatment zone in the process air through the mesh, while providing enough resistance to ensure even distribution of air. 为了进一步控制加热，使聚集团块在施加受热空气流210之后迅速经受淬火。  To further control heating, aggregated lumps applying heated air stream 210 after subjected to quenching quickly. 这种淬火可通过在聚集团块离开受控热控制流210之后立即抽出复合非织造纤维网10'上方和遍及整个复合非织造纤维网10'的周围空气而获得。 Such quenching may be aggregated clumps away controlled thermal flow control 210 immediately after extraction composite nonwoven fibrous web 10 'above and throughout the composite nonwoven fibrous web 10' is obtained by ambient air. 图2中的数字220代表下述区域，在该区域中，在网穿过热空气流之后通过排气装置抽取穿过网的周围空气。 Numeral 220 represents the following regions in FIG. 2, in this region, after the web passes through the stream of hot air through the ambient air drawn through the exhaust sites. 排气装置(未示出）可以沿着收集器延伸距离218超过加热装置200以确保整个复合非织造纤维网10'的彻底冷却和/或淬火。 Exhaust means (not shown) may extend along the collector from more than 218 to ensure that the heating device 200 throughout the composite nonwoven fibrous web 10 'is completely cooled and / or quenched. 图3示出用于制备根据本发明的复合非织造纤维网的设备400的替代的示例性实施例的示意图。  Figure 3 shows a schematic view according to an alternative preparation of a composite nonwoven fibrous web according to the present invention, apparatus 400 according to an exemplary embodiment. 图3示出用于以熔喷法制备非织造纤维网的颗粒加载设备60的用法。 Figure 3 illustrates the use of particles for the meltblown nonwoven web prepared SYSTEM loading device 60. 熔化形成纤维的聚合物材料通过入口63进入非织造模具62，流过模具腔体66的模具狭槽64 (都用虚线示出），并作为一系列原丝68通过喷丝孔（例如喷丝孔67)退出模具腔体66。 Molten fiber-forming polymeric material through the inlet 63 enters nonwoven die 62, flows through the mold cavity of the mold 66 the slot 64 (both shown in dashed lines), and as a series of strands 68 through a nozzle (e.g., nozzle hole 67) to exit the mold cavity 66. 通过空气歧管70输送的细化用流体（通常为空气）在模具出口72处将原丝68细化成纤维98。 Thinning fluid (usually air) delivered through the air manifold 70 of the die 72 at the outlet of the filaments 68 into fibers 98. 同时，颗粒74通过料斗76，穿过进料辊78和刮粉刀80。  Meanwhile, particles 7476 passing through the feed roller 78 and the doctor blade 80 through a hopper. 电动刷辊82使进料辊78旋转。 Electric brush roller 82 so that rotation of the feed rollers 78. 可使螺纹调整器84移动以改进幅材横向均匀度和通过进料辊78的颗粒渗漏速率。 Adjustment screw 84 can move in order to improve cross-web uniformity and through the feed rollers 78 of the leak rate of particles. 总颗粒流速可通过改变进料辊78的旋转速率来调整。 The total flow rate of the particles by varying the rate of rotation of the feed rollers 78 can be adjusted. 可以改变进料辊78的表面以优化用于不同颗粒的进料性能。 Feed rollers may be varied to optimize the surface 78 of the feed performance for different particles. 颗粒74的瀑布状物86从进料辊78穿过斜槽88落下。 86 particles was 74 falls through chute 88 fall from a feed roller 78. 空气或其它流体穿过歧管90和腔体92，并导向原丝68当中的流96中穿过沟槽94落下的颗粒74和聚合物材料的纤维98。 Air or other fluid through the manifold 90 and the cavity 92, the flow guide 96 and among the strands 68 through the slot 94 in the falling particles 74 and fibers 98 of the polymeric material. 颗粒74和纤维98的混合物形成自支承复合非织造纤维网10”，并着陆于多孔收集器150。可任选地是，可以从任选辊152进料任选支承层50，任选支承层50可以用于收集和支承复合非织造纤维网10”。 Mixture of particles 74 and fibers 98 are formed self-supporting composite nonwoven fibrous web 10 ", and lands on the porous collector 150. Optionally, the can 50, the support layer optionally feed roller 152 optionally support layer optionally and the support 50 can be used to collect the composite nonwoven fibrous web 10. " 图4示出用于制备根据本发明的复合非织造纤维网的设备500的另一个示例性实施例。  FIG. 4 illustrates the preparation of another exemplary embodiment of an apparatus for the composite nonwoven fibrous web 500 in accordance with the present invention. 图4示出用替代的熔喷纤维形成法制备复合非织造纤维网的颗粒加载设备60的用法。 Figure 4 illustrates the use of particles prepared by a composite nonwoven fibrous web loading apparatus 60 for forming an alternative meltblown fibers. 如图4总体所示，示例性设备500利用两个大致垂直的、倾斜设置的熔喷模具66，这两个熔喷模具66朝收集器100喷射大致相对的熔喷纤维流162、164。  As shown in FIG 4 Overall, the exemplary device 500 with two generally vertical inclined meltblowing die 66, the die 66 toward two meltblowing collector 100 generally opposite the injection stream 162 of meltblown fibers, 164. 同时，颗粒74穿过料斗166并进入导管168中。 Meanwhile, particles 74 pass through hopper 166 and into conduit 168. 气动涡轮170迫使空气穿过第二导管172，并因此将颗粒从导管168抽到第二导管172中。 Air turbine 170 forcing air through a second conduit 172, and thus the particles are drawn into the second conduit 172 from the conduit 168. 颗粒穿过喷嘴174作为内聚的颗粒流176而喷出，内聚的颗粒流176与熔喷纤维流162和164结合。 Particles through the nozzle 174 as stream 176 discharged cohesive particles, cohesive particle stream 176 combined with the stream of meltblown fibers 162 and 164. 颗粒流176与熔喷纤维流162和164形成自支承非织造纤维网10'"，并着陆于多孔收集器150。关于使用图4设备进行熔喷的方式的进一步的细节对于本领域的技术人员将是熟悉的。 Particle stream stream 176 of meltblown fibers 162 and 164 form a self-supporting nonwoven web 10 '', and landed on the porous collector 150. Further details regarding the manner of FIG. 4 using a device meltblown apparent to those skilled in the art It will be familiar. 本发明也涉及在多种吸收应用中使用本发明的复合非织造纤维网的方法。  The present invention also relates to methods of using the composite nonwoven fibrous web of the present invention in a variety of absorption applications. 在示例性实施例中，制品可以用作气体过滤制品、液体过滤制品、吸声制品、表面清洁制品、细胞生长支承制品、药物递送制品、个人卫生制品或伤口敷料制品。 In an exemplary embodiment, the article may be used as a gas filtration article, a liquid filtration article, a sound absorption article, a surface cleaning article, a cellular growth support article, a drug delivery article, a personal hygiene article, or a wound dressing article. 在某些示例性气体过滤应用中，例如本文所述的网可以提供得到很大改进的粒子捕集，而没有过度的压降。  In certain exemplary gas filtration applications, such as described herein may provide the network greatly improved particle collection, without excessive pressure drop. 颗粒本身可主动从空气捕集目标物质或气溶胶。 Particles themselves actively capture a target substance or an aerosol from the air. 通过利用较低纤维密度，这种系统将会比高度堆积的细小纤维层具有较低的压降。 By using a low fiber density, such a system will have a lower pressure drop than the height of the fine fiber layer deposited. 纤维和颗粒也可被充电为驻极体，从而提供额外的颗粒捕集性能。 Fibers and particles may also be electret charged, to provide additional particulate collection performance. 另外，由于密实度低而使得压降减小，所以本发明的某些示例性实施例的密实度低的复合非织造纤维网在气体过滤应用中可能是有利的。  Further, due to the low density such that the reduced pressure drop is low Solidity certain exemplary embodiments of the present invention, a composite nonwoven fibrous web in gas filtration applications be advantageous. 降低纤维网的密实度一般会减小其压降。 Decreasing the Solidity fiber web will generally reduce its pressure drop. 也可以导致在本发明的密实度低的亚微米复合非织造纤维网加载颗粒时压降增大降低。 It may also result in increased pressure drop decrease at low Solidity sub-micrometer of the present invention the composite particle loaded nonwoven fibrous web. 部分由于细小亚微米纤维网的密实度较高，所以目前用于形成颗粒加载的亚微米纤维的方法导致较粗微纤维网的较高压降。 Methods section due to the higher Solidity of the fine sub-micrometer fiber web, it is currently used to form a particle-loaded sub-micrometer fibers results in higher pressure drops coarser micro fiber web. 另外，由于亚微米纤维可以提供改进的颗粒捕集效率，所以将亚微米纤维用在气体过滤中可能是特别有利的。  Further, since the sub-micrometer fibers may provide improved particle capture efficiency, the sub-micrometer fibers in gas filtration may be particularly advantageous. 特别是，亚微米纤维可以比较粗纤维更好地捕集直径小的气载颗粒。 In particular, sub-micrometer fibers may be relatively coarse fibers to better capture small diameter airborne particulates. 例如，亚微米纤维可以更有效率地捕集维度小于约1000纳米（nm)、更优选地小于约500nm、甚至更优选地小于约lOOnm、最优选地低于约50nm的气载颗粒。 For example, sub-micrometer fibers may more efficiently capture a dimension of less than about 1000 nanometers (nm), more preferably less than about 500 nm, and even more preferably less than about lOOnm, and most preferably below about 50nm of airborne particulates. 气体过滤器（例如本例）在以下应用中可能特别可用：个人防护呼吸器；暖通空调（HVAC)过滤器；汽车空气过滤器（如汽车发动机空气清洁器、汽车排气过滤、汽车客舱空气过滤）；和其它气体颗粒过滤。 A gas filter (e.g. in this example) may be particularly useful in the following applications: personal protection respirators; HVAC (HVAC) filters; automotive air filters (e.g., automotive engine air cleaners, automotive exhaust gas filtration, automotive passenger compartment air filtration); and other gas-particulate filtration. 本发明的某些示例性复合非织造纤维网形式的密实度低的包含亚微米纤维的液体过滤器也可以具有下述优点：在保持用于捕集亚微米的液载颗粒的小孔尺寸的同时，改进深度加载。  Certain exemplary Solidity composite nonwoven fibrous web according to the present invention forms a low liquid filter comprises sub-micrometer fibers may have the following advantages: the liquid contained in a small holding sub-micron particle capture pore size, while improving the depth of loading. 这些性质通过允许过滤器捕集测试用颗粒中的更多者而不发生堵塞来改进加载性能。 These properties allow the filter by collecting test more of particles to improve the load performance without clogging occurs. 另外，对于某些液体过滤应用，连续颗粒相可以允许限定的孔结构，从而提供深度过滤功能。  In addition, the liquid was filtered for some applications, may allow for the continuous pore structure of the particulate phase is defined so as to provide depth filtration function. 此外，较大的纤维和/或颗粒表面积可以用于促进与过滤器的化学粘结或反应。 In addition, larger fibers and / or particle surface area may be used to facilitate chemical bonding of the filter or the reaction. 颗粒相也可以用于抑制由于处理、加工或使用而导致的压碎。 Particulate phase may also be used to suppress the handling, processing, or use of crushing. 本发明的某些示例性复合非织造纤维网也可以用作隔热或隔音材料。  Certain exemplary composite nonwoven fibrous webs of the invention can also be used as thermal or acoustic insulation material. 将网用作隔热材料可有利地利用本发明的某些实施例所提供的低纤维密度。 The web as insulating material may advantageously utilize low fiber density certain embodiments of the present invention is provided. 纤维密度较低可以允许隔离捕获更多的滞留空气，从而减小导热率。 Lower fiber density allows isolating capture more air entrapment, thereby reducing the thermal conductivity. 细小纤维的增大的表面积也可以用于消音和吸音。 Fines increased surface area may also be used for noise and sound absorption. 可以用于这种实施例的颗粒包括（但不限于）相变材料、气味吸收剂和气凝胶。 Particles may be used for this embodiment include (but are not limited to) the phase change material, odor absorbers and aerogels. 根据本发明的某些示例性实施例的低密度复合非织造纤维网也可以用在用于表面清洁（例如个人卫生和清洁应用中）的擦拭物中。  The low density composite nonwoven fibrous web of certain exemplary embodiments of the present invention may also be used in a wipe for cleaning the surface (e.g., personal hygiene and cleaning applications) in. 密度低的结构可以允许用于更好的流体控制，同时可选择颗粒，从而得到例如吸收性、抗微生物性或气味控制的性质。 Low density structures may allow for better fluid control, while select particles to obtain properties such as absorbency, antimicrobial or odor control. 当用作擦拭物时，密度低的结构也提供更好的将灰尘、污垢和碎屑捕获在织物内的机会。 When used as a wipe, low density structure will provide a better opportunity within the fabric dust, dirt and debris capture. 某些示例性实施例的密实度低的复合非织造纤维网所提供的结构也可以有效地用于提供柔软的擦拭物，同时密实度低可以提供用于清洁剂的贮存器和用于捕获碎屑的孔体积大的优点。 Some structures low Solidity exemplary embodiment of the composite nonwoven fibrous web may also be provided effectively used to give a soft wipe, while low Solidity may be provided a reservoir for cleaning agents and for capturing broken the pore volume of the advantages of large chips. 本发明的一些示例性实施例的密实度低的包含亚微米纤维的复合非织造纤维网也可以是用于支承隔膜的优选基底。 Some low Solidity exemplary embodiment of a composite nonwoven fibrous web comprises sub-micrometer fibers  The present invention may also be preferred substrate for supporting the diaphragm. 密实度低的细小纤维网可充当隔膜的物理支承，但也可充当深度预过滤器，从而提高隔膜的寿命。 Low Solidity fine web may act as a physical support for the membrane, but may also act as a depth pre-filter, thereby increasing the life of the diaphragm. 使用这种系统可充当高效对称或不对称的隔膜。 Using such a system can act as effective symmetric or asymmetric membrane. 这种隔膜的应用包括离子滤出、超滤、反渗透、选择性粘结和/或吸附以及燃料电池传送和反应系统。 Such applications include ion membrane was filtered off, ultrafiltration, reverse osmosis, selective binding and / or adsorption, and fuel cell transport and reaction systems. 本发明的一些特定实施例的密实度低的亚微米复合非织造纤维网也可以是用于促进细胞生长的可用的合成基质。  Some specific embodiments of low Solidity sub-micrometer composite nonwoven fibrous webs of the invention may also be available for synthetic substrate to promote cell growth. 具有细小亚微米纤维的开放式结构可以是模拟天然存在系统，并促进更类似于体内的行为。 Open structure with fine sub-micrometer fibers may be an analog of naturally occurring systems and promotes more in vivo like behavior. 这与目前的产品（例如可得自Donaldson Corp.(Minneapolis, Minnesota)的Donaldson Ultra-ffeb™ 合成ECM)，在该产品中，高密实度纤维网充当合成基底膜，在纤维基质内很少有细胞渗透或没有细胞渗透。 This current products (e.g., available from Donaldson Corp. (Minneapolis, Minnesota) in Donaldson Ultra-ffeb ™ Synthesis of the ECM), in the product, the web acts as a high-density synthetic basement membrane, there is little in the fiber matrix no cell penetration or cell infiltration. 根据本发明的某些示例性实施例的密实度低的粒子加载的亚微米纤维网也可以用于促进非织造网内的细胞生长。  The low Solidity certain exemplary embodiments of the present invention, the particle-loaded sub-micrometer fiber web may also be used to facilitate cell growth in a nonwoven web. 具有足够细小的纤维可使得细胞可将纤维用作合成基质，同时颗粒可用于供应营养物质、生物活性化合物、抗微生物制剂等等。 Having a sufficiently fine fibers such as synthetic fibers may be the cell matrix, while the particles may be used to supply nutrients, bioactive compounds, antimicrobial formulation and the like. 如果非织造纤维网的密实度过高，则目标细胞不可能在纤维基质内生长，从而可能导致不同的细胞行为。 If compacting the nonwoven web is too high, the target cell can not grow in the fiber matrix, which may result in a different cell behavior. 在一些应用中，根据本发明的某些示例性实施例的非织造复合纤维网可以用于药物递送和/或伤口敷料。  In some applications, according to certain exemplary embodiments the nonwoven composite web embodiment of the present invention may be used in drug delivery and / or wound dressings. 例如，颗粒可被选择为用于递送到伤口进行处理的药物。 For example, the particles may be selected for delivery to a wound treatment medicament. 在某些示例性实施例中，如所述的复合非织造纤维网也可以具有许多有利的独特的处理优点。  In certain exemplary embodiments, as the composite nonwoven fibrous web may have a number of unique advantageous process advantages. 例如，在某些示例性实施例中，可制备可用的成品，该成品仅包含单层，但包含颗粒和纤维的混合物，所述纤维可以包含微纤维、超细微纤维和/或亚微米纤维。 For example, in certain exemplary embodiments, may be prepared by the finished product, the finished product contains only a single layer, but comprising a mixture of particles and fibers, the fibers may comprise microfibers, ultrafine microfibers and / or sub-micrometer fibers. 这种单层纤维网可以提供重要的制备效率；例如，通过去除层合工艺及设备并通过减少中间材料的数量，可以降低产品复杂性和浪费。 Such single-layer fiber web may provide important production efficiency; e.g., by removing the laminating processes and equipment and by reducing the number of intermediate material, the product can reduce the complexity and waste. 考虑到制备本发明的某些示例性实施例的网的直接网形成性质，本发明的某些示例性实施例的网可以是十分经济的，在所述直接网形成性质中，在一个必要的直接操作中将形成纤维的聚合物材料转变到网中。 Considering the net net direct certain exemplary embodiments of the present invention is prepared forming properties, some exemplary network embodiment of the present invention can be very economical, the web is formed directly in nature, in a necessary direct fiber-forming operation in the transition to the polymeric material web. 另外，如果网的纤维均具有相同的聚合物组合物，则该网可完全回收利用。 Further, if the web fibers have the same polymer composition, the web may be completely recyclable. 另外，本发明的某些示例性实施例的复合非织造纤维网可以用于制备多层产品，也可以以多种物理形式使用该复合非织造纤维网。  Further, the composite nonwoven fibrous web of certain exemplary embodiments of the present invention may be used to prepare multilayer product may be using the composite nonwoven fibrous web in a variety of physical forms. 例如，它可以是模制的或褶皱的，并可以以其收集的网形式使用它。 For example, it may be a molded or pleated, and may be used with its gathered web form. 在本发明的某些示例性实施例中，可以通过使用直径非常小的纤维（如超细微纤维和/或亚微米纤维），为网提供极大增加的纤维表面积，从而具有例如改进过滤和隔热或隔音性能这种有益效果。 In certain exemplary embodiments of the present invention, by the use of very small diameter fibers (e.g., ultra-fine fibers and / or sub-micrometer fibers), to provide significant net increase in fiber surface area, thereby improving filtration and separated with e.g. thermal or sound insulation performance of such benefit. 在一些实施例中，可以通过使用不同直径的纤维为特定用途定制流体过滤和吸音中的吸收性。 In some embodiments, the fluid may be customized filtration and sound absorption in the absorbent fibers for specific purposes by using different diameters. 遍及复合非织造纤维网的压降也可以较低。 Throughout the composite nonwoven fibrous web may drop lower. 在某些示例性实施例中，根据本发明的复合非织造纤维网公开了多孔片材材料可以用于捕集或吸附多种化学材料，包括有机溶剂、无机蒸气和本领域技术人员熟悉的其它材料。  In certain exemplary embodiments, the composite according to the present invention, discloses a nonwoven web of sheet material may be porous for trapping or more chemical adsorbing material comprises an organic solvent, and inorganic vapor skilled in the art other materials familiar. 正如本领域的技术人员所熟知，也可以采用一个或多个额外的层，如覆盖网、加强层、粒状过滤层（例如带电的非织造网或其他功能层或装饰层）。  As the skilled person in the art, may be used one or more additional layers, such as overlay, the reinforcement layer, the granular filtering layer (e.g. a nonwoven web of charged or other functional or decorative layers). 本发明所公开的复合非织造纤维网对于制备旨在用于包含溶剂的大气环境中的个人呼吸器的可置换滤筒可能是尤其可用的。 The composite nonwoven fibrous web according to the present invention is disclosed for the preparation of personal respirators intended for containing a solvent atmosphere in a replaceable cartridge may be particularly useful. 然而，本发明所公开的复合非织造纤维网可具有多种额外的用途。 However, the composite nonwoven fibrous web as disclosed in the present invention may have a variety of additional uses. 例如，示例性的复合非织造纤维网可以用于个人或集体防护设备，如化学防护套装、罩子、单独的封闭结构（如隔绝室）、掩蔽结构（如帐篷或其他便携式或永久式结构）以及其他的空气被所述多孔薄片制品过滤后进入其中的个人或集体防护设备。  For example, exemplary composite nonwoven fibrous web may be used for personal or collective protective equipment, such as chemical protective suits, cover, separate closed structure (e.g., isolation chamber), the masking structure (such as tents or other portable or permanent formula ) as well as other air entering the porous sheet article wherein individual or collective protective equipment after filtration. 本发明所公开的网也可以由适当的外壳支承，从而得到过滤器，以用于调节进入或在封闭区（例如建筑物或车辆）内循环的气体。 The network disclosed in the present invention may also be supported by a suitable housing, whereby the filter, or for adjusting into the enclosed area (such as a building or a vehicle) within the circulating gas. 本发明所公开的网也可与另外的（如现有的）过滤器结构组合起来，用于形成预过滤器或后过滤器。 The network disclosed in the present invention may also be combined with additional (e.g., conventional) filter arrangement for forming a pre-filter or post-filter. 其他用途是本领域的技术人员所熟知的。 Other uses are those of skill in the art. 以上描述了本发明的示例性实施例，并在以下通过下面的实例进一步对本发明进行说明，不应当以任何方式将这些实例理解为对本发明范围的限制。  the above described exemplary embodiments of the present invention, and the present invention is further illustrated by the following examples, without in any way should these examples be construed as limiting the scope of the invention. 相反，应当清楚地理解，可以采取多种其他实施例、修改形式及其等同物，在本领域的技术人员阅读本文的说明之后，在不脱离本发明的精神和/或所附权利要求书的范围的前提下，这些其他实施例、修改形式及其等同物将显而易见。 Instead, it should be clearly understood, may take various other embodiments, modifications, and equivalents thereof which, after reading those skilled in the art described herein, without departing from the spirit and / or claimed in the appended claims of the present invention, under the scope of these other embodiments, modifications, and equivalents thereof will become apparent. 此外，虽然阐述本发明广义范围的数值范围和参数是近似值，但在具体实施例中所列出的数值是尽可能精确地记录的。 In addition, although the numerical ranges and parameters set forth in the broad scope of the present invention are approximations, the numerical values ​​set forth in the specific examples embodiments is recorded as precisely as possible. 然而，任何数值固有地包含某些误差，这些误差不可避免地存在于各自测试测量中的标准偏差所致。 However, any numerical value inherently contains certain errors, which inevitably exist in the respective testing measurements the standard deviation caused. 在最低程度上，每一个数值参数不是意图将等同原则的应用限制于权利要求保护的范围，但至少应该根据所报告的有效数字的数、并运用惯常的四舍五入法来解释每一个数值参数。 At a minimum number, each numerical parameter is not intended to be of significant figures of the doctrine of equivalents to limit the application scope of the claims, but should at least be based on the reported and by applying ordinary rounding techniques each numerical parameter. 可通过美国专利No. 4，536，361中所述的方法将各个颗粒流与纤维流结合来制备示例性复合纤维网。  each particle stream can flow to the fiber by the method described in U.S. Patent No. 4,536,361 will be prepared in conjunction with exemplary composite fibrous web. 该方法被构造为使得朝水平真空收集器将纤维形成模具定位在水平面下方成大约45度的角度。 The method is configured such that the horizontal vacuum collector positioned below the fiber-forming die at an angle of approximately 45 degrees in a horizontal plane. 从纤维模具上方的托盘筛出颗粒，使得颗粒流竖直地落到纤维流中。 Fibers from the tray above the mold sieved particles, so that the fibers fall vertically particle flow stream. 在真空收集器上收集复合纤维网，并从收集带将该复合纤维网卷起。 Composite web was collected on the vacuum collector and the collection belt from the composite web winding. 在收集带上形成网之后，没有进行任何额外的粘结。 After the collection belt to form a web, without any additional adhesive. 纤维处理使用 Total Petrochemicals (Houston, Texas)的3960 级聚丙烯。  fiber treatment using Total Petrochemicals (Houston, Texas) 3960 grade polypropylene. 使用3/4"直径单螺杆挤出机将聚合物熔化，并将该聚合物进料到亚微米纤维形成模具。将模具加热到290°C，并以每分钟7克的速率向模具进料聚合物。在每平方英寸80磅的压力下将室温空气进料到模具。对所有样品，纤维处理条件保持恒定。 3/4 "diameter single screw extruder melts the polymer and the polymer is fed into the sub-micrometer fibers forming the mold. The mold was heated to 290 ° C, and at a rate of 7 grams per minute fed to the mold polymer. at a pressure of 80 pounds per square inch of room temperature air fed to the mold. kept constant for all samples, fiber treatment conditions. 样品E : 240粗粒氧化铝研磨粉末。  Sample E: 240 grit aluminum oxide abrasive powder. 使用扫描电子显微镜法测量样品A的中值纤维直径；样品A的中值纤维直径为0. 86微米。 Median fiber diameter of Sample A was measured  using a scanning electron microscopy; median fiber diameter of Sample A 0.86 microns. 测量每一个样品的基重，并在表I中记录结果。 Measuring the basis weight of each sample and the results recorded in Table I below. 根据每一个样品中的纤维的基重计算的纤维质量比率在所有样品中几乎保持恒定。  In all the samples remains almost constant in accordance with the mass ratio of the fibers in each sample fiber basis weight calculations. 测量取决于所施加的压力的每一个样品的厚度，作为颗粒加载的网样品的抗压碎性的测量。 The thickness of each sample  measurements are dependent on the applied pressure, as an anti-particle-loaded web sample measurements of crushing. 使用15、30、60、120、150和225帕斯卡压力，并以密耳为单位测量网厚度（一密·耳对应于25微米）。 Use 15,30,60,120,150 and 225 pascals pressure, and is measured in mils thickness of the web (corresponding to a secret-ear 25 microns). 抗压碎性结果被表达为在给定的所施加的压力下测量的网厚度与15Pa压力下的网厚度的比率，因此，被归一化为100%。 Crush resistance results are expressed as the ratio of web thickness and web thickness measured under a pressure of 15Pa at a given pressure being applied, thus, normalized to 100%. 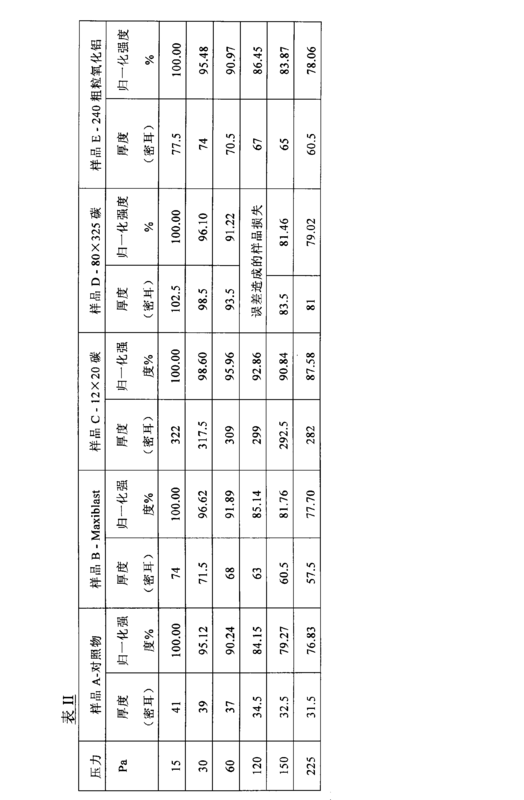 表II中示出测量厚度和抗压碎性随施加的压力结果而变。 Table II shows the results of measuring the pressure and the thickness applied with the crush resistance becomes. 所有颗粒加载的复合纤维网显示出与对照网相比得到改进的抗压缩性。 All particle loading composite web exhibits improved as compared with the control network resistance to compression. 定特征、结构、材料或特性包括在本发明的某些示例性实施例中的至少一个实施例中。 Feature, structure, material, or characteristic comprises at least one exemplary embodiment] In certain embodiments of the present invention. 因此，贯穿本说明书的多处出现的短语（例如“在一个或多个实施例中”、“在某些实施例中”、“在一个实施例中”或“在实施例中”）并非不可避免地参见本发明的某些示例性实施例中的同一实施例。 Thus, appearances of the phrases throughout this specification (e.g., "in one or more embodiments," "in some embodiments", "in one embodiment" or "in an embodiment") is not impossible Referring to avoid certain exemplary embodiments of the present invention in the same embodiment. 此外，某些特征、结构、材料或特性可以任何适合的方式在一个或多个实施例中结合。 Moreover, certain features, structures, materials, or characteristics may be in any suitable manner in conjunction with one or more embodiments. 虽然本说明书详细描述了某些示例性实施例，但应当理解，本领域的技术人员在理解上述内容后，可以易于设想这些实施例的更改形式、变型形式和等同形式。  While the specification has described in detail certain exemplary embodiments, it is to be appreciated that those skilled in the art upon understanding of the foregoing, may readily conceive of alterations to these embodiments, modifications and equivalents. 因此，应当理解，本发明不应不当地受限于以上示出的示例性实施例。 Accordingly, it should be understood that the present invention is not to be unduly limited to the above exemplary embodiment shown. 特别是，如本文所用，端点的数值范围的表述旨在包括该范围内所包括的所有数值（如I至5包括I、1. 5、2、2. 75、3、3. 80、4和5)。 In particular, as used herein, the expression numerical ranges by endpoints is intended to include all numbers subsumed within that range includes (e.g., I to 5 comprising I, 1. 5,2,2. 75,3,3. 80,4 and 5). 另外，假设本文所使用的所有数值都用术语“约”修饰。 It is assumed that all numbers used herein by the term "about". 此外，本文提及的所有出版物和专利全文以引用方式并入本文，犹如被特别地和单独地指出的各个出版物或专利都以引用方式并入的程度。 Furthermore, all publications and patents mentioned herein are incorporated herein by reference in entirety as if each was specifically and extent publication or patent were individually indicated to be incorporated by reference. 以上描述了多种示例性实施例。 Above describe various exemplary embodiments. 这些实施例和其它实施例都在以下权利要求书的范围内。 These embodiments and other embodiments are within the scope of the following claims. 1. 一种复合非织造纤维网，包含： 嵌入相，所述嵌入相包含一组颗粒，每个单独颗粒与至少一个其它颗粒面对面接触，由此形成颗粒链状的由单独颗粒构成的基本上连续的三维网；以及基质相，所述基质相包含围绕所述颗粒形成三维网的一组纤维。 1. A composite nonwoven fibrous web, comprising: embedding the phase, the phase comprises a set of embedded particles, each of the individual particles with particles of at least one other face to face contact, thereby forming a chain of particles consisting essentially of individual particles continuous three-dimensional network; and a matrix phase, said matrix phase comprising a population of fibers forming a three-dimensional network around the particles. 2.根据权利要求I所述的复合非织造纤维网，其中所述一组颗粒选自无机颗粒、有机颗粒或它们的组合。 2. The composite according to claim nonwoven fibrous web of claim I, wherein said particles are selected from a group of inorganic particles, organic particles, or a combination thereof. 3.根据权利要求I所述的复合非织造纤维网，其中所述一组颗粒包含非均一的固态颗粒、基本上均一的固态颗粒、中空泡、短纤维或它们的组合。 3. The composite according to claim nonwoven fibrous web of claim I, wherein the set of non-uniform particles comprise solid particles, substantially uniform solid particles, hollow bubbles, staple fibers, or combinations thereof. 4.根据权利要求I所述的复合非织造纤维网，其中所述一组颗粒包含吸收剂、吸附剂、活性炭、阴离子交换树脂、阳离子交换树脂、分子筛或它们的组合。 According to claim composite nonwoven fibrous web of claim I, wherein the particles comprise a set of an absorbent, an adsorbent, activated carbon, an anion exchange resin, cation exchange resin, molecular sieves, or a combination thereof. 5.根据权利要求I所述的复合非织造纤维网，其中所述一组颗粒的中值直径为至少一微米（μ m)。 According to claim composite nonwoven fibrous web of claim I, wherein the set median particle diameter of at least one micrometer (μ m). 7.根据权利要求I所述的复合非织造纤维网，其中包含所述一组纤维的三维网为基本上连续的。 According to claim composite nonwoven fibrous web of claim I, wherein three-dimensional network comprising a set of fibers is substantially continuous. 8.根据权利要求I所述的复合非织造纤维网，其中所述一组纤维为取向的。 According to claim composite nonwoven fibrous web of claim I, wherein the group of fibers are oriented. 10.根据权利要求9所述的复合非织造纤维网，其中所述一组纤维的中值纤维直径在从O. 2 μ m到O. 9 μ m的范围内。 Claim 10. The composite nonwoven fibrous web of claim 9, wherein said set of fibers median fiber diameter of from 2 [mu] m into the O. O. 9 μ m in range. 12.根据权利要求11所述的复合非织造纤维网，其中所述一组纤维的中值纤维直径在从2 μ m到50 μ m的范围内。 Claim 12. The composite nonwoven fibrous web of claim 11, wherein said set of fibers median fiber diameter of from 2 μ m to 50 μ m in the range. 13.根据权利要求I所述的复合非织造纤维网，其中所述纤维网具有厚度，并显示具有小于10%的密实度。 Claim 13. The composite nonwoven fibrous web of claim I, wherein the fibrous web has a thickness and exhibits a Solidity of less than 10%. 14.根据权利要求I所述的复合非织造纤维网，其中所述一组纤维包含聚合物纤维。 Claim 14. The composite nonwoven fibrous web of claim I, wherein the group of fibers comprise polymeric fibers. 15.根据权利要求14所述的复合非织造纤维网，其中所述聚合物纤维包含聚丙烯、聚乙烯、聚酯、聚对苯二甲酸乙二醇酯、聚对苯二酸丁二醇酯、聚酰胺、聚氨酯、聚丁烯、聚乳酸、聚乙烯醇、聚苯硫醚、聚砜、液晶聚合物、聚乙烯-共-乙酸乙烯酯、聚丙烯腈、环状聚烯烃、聚氧甲烯、多烯键热塑性弹性体或它们的组合。 Claim 15. The composite nonwoven fibrous web of claim 14, wherein said polymeric fibers comprise polypropylene, polyethylene, polyester, polyethylene terephthalate, polyethylene terephthalate, polybutylene terephthalate , polyamide, polyurethane, polybutene, polylactic acid, polyvinyl alcohol, polyphenylene sulfide, polysulfone, liquid crystal polymers, polyethylene - co - vinyl acetate, polyacrylonitrile, cyclic polyolefm, polyoxymethylene alkenyl, multi-ethylenically thermoplastic elastomer or a combination thereof. 16.根据权利要求14所述的复合非织造纤维网，其中所述聚合物纤维包含聚烯烃纤维。 Claim 16. The composite nonwoven fibrous web of claim 14, wherein the polymeric fibers comprise polyolefin fibers. 17.根据权利要求I所述的复合非织造纤维网，其中所述一组颗粒的至少一部分被粘结到分开形成的纤维的至少一部分。 Claim 17. The composite nonwoven fibrous web of claim I, wherein at least a portion of the population of particulates are bonded to at least a portion of the separately formed fibers. 18.根据权利要求17所述的复合非织造纤维网，其中粘结到分开形成的纤维的至少一部分的所述一组颗粒利用以下方法进行粘结：热粘结、粘合剂粘结、粉状粘结剂粘结、摩擦粘结、水刺法、针刺法、压延或它们的组合。 Claim 18. The composite nonwoven fibrous web of claim 17, wherein at least a portion of the fibers bonded to a separate set of particles formed by the following bonding methods: thermal bonding, adhesive bonding, powder shaped adhesive bonding, friction bonding, hydroentangling, needlepunching, calendering, or a combination thereof. 19.根据权利要求I所述的复合非织造纤维网，其中围绕所述颗粒形成三维网的所述一组纤维包含亚微米纤维。 19. The composite nonwoven fibrous web in claim I wherein said particles are formed around the three-dimensional network of fibers comprising a set of sub-micrometer fibers. 20.根据权利要求19所述的复合非织造纤维网，其中所述基质相还包含一组微纤维。 20. The composite nonwoven fibrous web according to claim 19, wherein said matrix phase further contains a set of micro fibers. 21.根据权利要求20所述的复合非织造纤维网，其中所述一组微纤维在组成上与所述一组亚微米纤维相同。 Claim 21. The composite nonwoven fibrous web of claim 20, wherein the microfibers and sub-micrometer fibers to the same compositionally. 22.根据权利要求20所述的复合非织造纤维网，其中所述一组微纤维与所述一组亚微米纤维分开形成。 Claim 22. The composite nonwoven fibrous web of claim 20, wherein the microfibers are formed with the set of sub-micrometer fibers to separate. 23.根据权利要求20所述的复合非织造纤维网，其中所述复合非织造纤维网具有厚度，并且亚微米纤维数与微纤维数的比率在所述复合非织造纤维网的整个厚度上有差别。 Claim 23. The composite nonwoven fibrous web of claim 20, wherein the composite nonwoven fibrous web has a thickness, and the ratio of the number of sub-micrometer fibers and microfibers have a number across the thickness of the composite nonwoven fibrous web difference. 24.根据权利要求23所述的复合非织造纤维网，其中所述亚微米纤维数与所述微纤维数的比率在所述复合非织造纤维网的整个厚度上递减。 Claim 24. The composite nonwoven fibrous web of claim 23, wherein the ratio of the number of sub-micrometer fibers to the number of micro fibers decreases in the entire thickness of the composite nonwoven fibrous web. 25.根据权利要求23所述的复合非织造纤维网，其中所述亚微米纤维数与所述微纤维数的比率从峰值变化到较低值，所述峰值靠近由所述复合非织造纤维网的一半厚度限定的中心线，所述较低值在所述复合非织造纤维网的表面处。 Claim 25. The composite nonwoven fibrous web of claim 23, wherein the number of sub-micrometer fibers to the ratio of the number of micro fibers varies from a peak to a lower value, close to the peak from the composite nonwoven fibrous web the half of the thickness center line is defined, a lower value at the surface of the composite nonwoven fibrous web. 26.根据权利要求I所述的复合非织造纤维网，还包含支承层。 Claim 26. The composite nonwoven fibrous web of claim I, further comprising a support layer. 27.根据权利要求26所述的复合非织造纤维网，其中所述支承层包含非织造物、织造物、针织织物、泡沫层、膜、纸质层、背胶层或它们的组合。 Claim 27. The composite nonwoven fibrous web of claim 26, wherein said support layer comprises a nonwoven, a woven, a knitted fabric, a foam layer, a film, a paper layer, adhesive layer, or a combination thereof. 28.根据权利要求26所述的复合非织造纤维网，其中所述支承层包含聚合物型非织造物。 Claim 28. The composite nonwoven fibrous web of claim 26, wherein said support layer comprises a polymeric nonwoven fabric. 29.根据权利要求26所述的复合非织造纤维网，其中所述支承层包含粘结的短纤维网，并且其中所述支承层利用以下方法进行粘结：热粘结、粘合剂粘结、粉状粘结剂、水刺法、针刺法、压延或它们的组合。 Claim 29. The composite nonwoven fibrous web of claim 26, wherein said support layer comprises a bonded staple fiber webs, and wherein said support layer bonded by the following methods: thermal bonding, adhesive bonding , powdered binder, hydroentangling, needlepunching, calendering, or a combination thereof. 30. 一种制备复合非织造纤维网的方法，包括： a.形成嵌入相，所述嵌入相包含基本上连续的三维网中的一组颗粒，每个单独颗粒与至少一个其它颗粒面对面接触，由此形成颗粒链；以及b.形成基质相，所述基质相包含围绕所述颗粒形成三维网的一组纤维。 30. A composite nonwoven fibrous web prepared, comprising:. A form fitted with a set of embedded particulate phase comprising a substantially continuous three-dimensional network of particles of each individual particle in contact with at least one other face to face, thereby forming chains of particles; and b. forming a matrix phase, said matrix phase comprising a population of fibers forming a three-dimensional network around the particulates. 31.根据权利要求30所述的方法，其中所述一组颗粒包含非均一的固态颗粒、基本上均一的固态颗粒、中空泡、短纤维或它们的组合。 31. The method according to claim 30, wherein the set of non-uniform particles comprise solid particles, substantially uniform solid particles, hollow bubbles, staple fibers, or combinations thereof. 32.根据权利要求30所述的方法，其中所述一组颗粒包含吸收剂、吸附剂、活性炭、阴离子交换树脂、阳离子交换树脂、分子筛或它们的组合。 32. The method according to claim 30, wherein the particles comprise a set of an absorbent, an adsorbent, activated carbon, an anion exchange resin, cation exchange resin, molecular sieves, or a combination thereof. 33.根据权利要求30所述的方法，其中所述一组颗粒的中值直径为至少一微米（μπι)。 33. The method according to claim 30, wherein the median diameter of a set of particles of at least one micrometer (μπι). 34.根据权利要求30所述的方法，其中所述一组颗粒的中值直径小于I μ m。 34. The method according to claim 30, wherein the median diameter of a set of particles smaller than I μ m.
35.根据权利要求30所述的方法，其中包含所述一组纤维的三维网为基本上连续的。 35. The method according to claim 30, wherein said set comprising three-dimensional network of fibers is substantially continuous. 36.根据权利要求30所述的方法，其中所述一组纤维为取向的。 36. The method according to claim 30, wherein said set of fibers are oriented. 37.根据权利要求30所述的方法，其中所述一组纤维的中值直径小于I μ m。 37. The method according to claim 30, wherein the median diameter of a set of fibers is less than I μ m.
38.根据权利要求37所述的方法，其中所述一组纤维的中值纤维直径在从O. 2 μ m到O. 9μπι的范围内。 38. The method according to claim 37, wherein said set of fibers median fiber diameter in the range from the O. 2 μ m is O. 9μπι. 39.根据权利要求30所述的方法，其中所述一组纤维的中值直径为至少Ιμπι。 39. The method according to claim 30, wherein the median diameter of a set of fibers is at least Ιμπι. 41.根据权利要求30所述的方法，其中所述纤维网具有厚度，并显示具有小于10%的密实度。 41. The method according to claim 30, wherein said web has a thickness and exhibits a Solidity of less than 10%. 42.根据权利要求30所述的方法，其中所述一组纤维包含聚合物纤维。 42. The method according to claim 30, wherein said set of fibers comprise polymeric fibers. 43.根据权利要求42所述的方法，其中所述聚合物纤维包含聚丙烯、聚乙烯、聚酯、聚对苯二甲酸乙二醇酯、聚对苯二酸丁二醇酯、聚酰胺、聚氨酯、聚丁烯、聚乳酸、聚乙烯醇、聚苯硫醚、聚砜、液晶聚合物、聚乙烯-共-乙酸乙烯酯、聚丙烯腈、环状聚烯烃、聚氧甲烯、多烯键热塑性弹性体或它们的组合。 43. The method according to claim 42, wherein said polymeric fibers comprise polypropylene, polyethylene, polyester, polyethylene terephthalate, polyethylene terephthalate, polybutylene terephthalate, polyamide, polyurethane, polybutene, polylactic acid, polyvinyl alcohol, polyphenylene sulfide, polysulfone, liquid crystal polymers, polyethylene - co - vinyl acetate, polyacrylonitrile, cyclic polyolefm, polyoxymethylene, polyenes key thermoplastic elastomer or a combination thereof. 44.根据权利要求42所述的方法，其中所述聚合物纤维包含聚烯烃纤维。 44. The method according to claim 42, wherein said polymeric fibers comprise polyolefin fibers. 45.根据权利要求30所述的方法，其中所述一组颗粒的至少一部分被粘结到分开形成的纤维的至少一部分。 At least a portion 45. The method of claim 30, wherein the population of particulates are bonded to at least a portion of the separately formed fibers. 46.根据权利要求45所述的方法，其中粘结到分开形成的纤维的至少一部分的所述一组颗粒利用以下方法进行粘结：热粘结、粘合剂粘结、粉状粘结剂粘结、摩擦粘结、水刺法、针刺法、压延或它们的组合。 46. ​​The method according to claim 45, wherein at least a portion of said fibers bonded to a separate set of particles formed by the following bonding methods: thermal bonding, adhesive bonding, powdered binder bonding, friction bonding, hydroentangling, needlepunching, calendering, or a combination thereof. 47.根据权利要求30所述的方法，其中围绕所述颗粒形成三维网的所述一组纤维包含亚微米纤维。 47. The method according to claim 30, wherein said particles are formed around the set of three-dimensional network of fibers comprising sub-micron fibers. 48.根据权利要求47所述的方法，其中所述基质相还包含一组微纤维。 48. The method according to claim 47, wherein said matrix phase further contains a set of micro fibers. 49.根据权利要求48所述的方法，其中所述一组微纤维在组成上与所述一组亚微米纤维相同。 49. The method according to claim 48, wherein the microfibers and sub-micrometer fibers to the same compositionally. 50.根据权利要求48所述的方法，其中所述一组微纤维与所述一组亚微米纤维分开形成。 50. The method according to claim 48, wherein said forming a set of said microfibers with a separate set of sub-micrometer fibers. 51.根据权利要求48所述的方法，其中所述复合非织造纤维网具有厚度，并且亚微米纤维数与微纤维数的比率在所述复合非织造纤维网的整个厚度上有差别。 51. The method according to claim 48, wherein the composite nonwoven fibrous web has a thickness, and the ratio of the number of sub-micrometer fibers to the number of microfibers difference across the thickness of the composite nonwoven fibrous web. 52.根据权利要求51所述的方法，其中所述亚微米纤维数与所述微纤维数的比率在所述复合非织造纤维网的整个厚度上递减。 52. The method of claim 51, wherein the ratio of the number of sub-micrometer fibers to the number of micro fibers decreases in the entire thickness of the composite nonwoven fibrous web. 53.根据权利要求51所述的方法，其中所述亚微米纤维数与所述微纤维数的比率从峰值变化到较低值，所述峰值靠近由所述复合非织造纤维网的一半厚度限定的中心线，所述较低值在所述复合非织造纤维网的表面处。 53. The method according to claim 51, wherein the ratio of the number of sub-micrometer fibers to the number of microfibers varies from a peak value to a lower value, defined by the peak and close to half the thickness of the composite nonwoven fibrous web centerline, the lower value at the surface of the composite nonwoven fibrous web. 54.根据权利要求30所述的方法，还包括为所述嵌入相和所述基质相中的一者或两者提供支承层。 54. The method of claim 30, further comprising providing a support layer to one or both of the embedded phase and the matrix phase. 55.根据权利要求54所述的方法，其中所述支承层包含非织造物、织造物、针织织物、泡沫层、膜、纸质层、背胶层或它们的组合。 55. The method of claim 54, wherein said support layer comprises a nonwoven, a woven, a knitted fabric, a foam layer, a film, a paper layer, adhesive layer, or a combination thereof. 56.根据权利要求54所述的方法，其中所述支承层包含聚合物型非织造物。 56. The method according to claim 54, wherein said support layer comprises a polymeric nonwoven fabric. 57.根据权利要求54所述的方法，其中所述支承层包含粘结的短纤维网，并且其中所述粘结的短纤维的至少一部分利用以下方法粘结到所述嵌入相和所述基质相中的一者或两者：热粘结、粘合剂粘结、粉状粘结剂、水刺法、针刺法、压延或它们的组合。 57. The method of claim 54, wherein said support layer comprises a bonded staple fiber webs, and wherein at least a portion of the staple fibers using a method of bonding the insert is bonded to the matrix phase and one or both phases: thermal bonding, adhesive bonding, powdered binder, hydroentangling, needlepunching, calendering, or a combination thereof. 58. 一种包含根据权利要求30所述的方法制备的复合非织造纤维网的制品，所述制品选自气体过滤制品、液体过滤制品、吸声制品、表面清洁制品、细胞生长支承制品、药物递送制品、个人卫生制品和伤口敷料制品。 58. A method comprising the composite nonwoven fibrous web prepared according to the method of claim 30 article, the article is selected from a gas filtration article, a liquid filtration article, a sound absorption article, a surface cleaning article, a cellular growth support article, a drug delivery article, a personal hygiene article, and a wound dressing article.